Big News!! 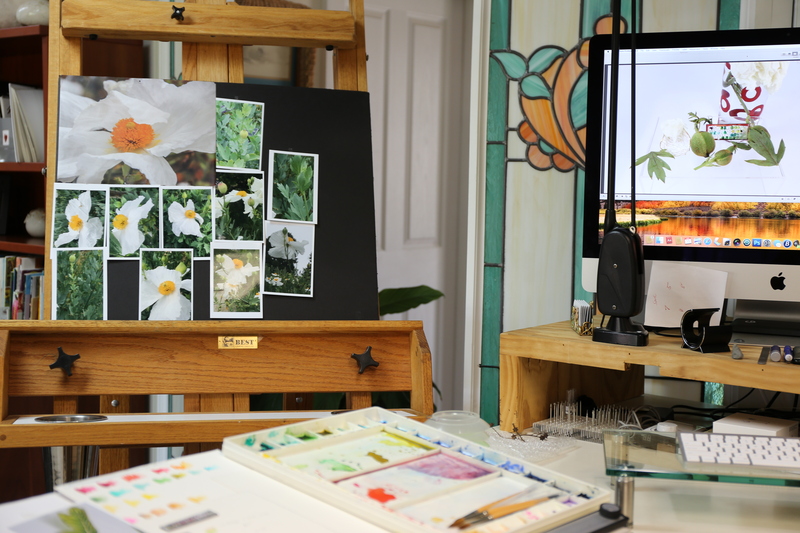 The “Matilija Poppy” is going to Sotheby’s Yahooooooo. Keep your eyes open, and watch our updates. 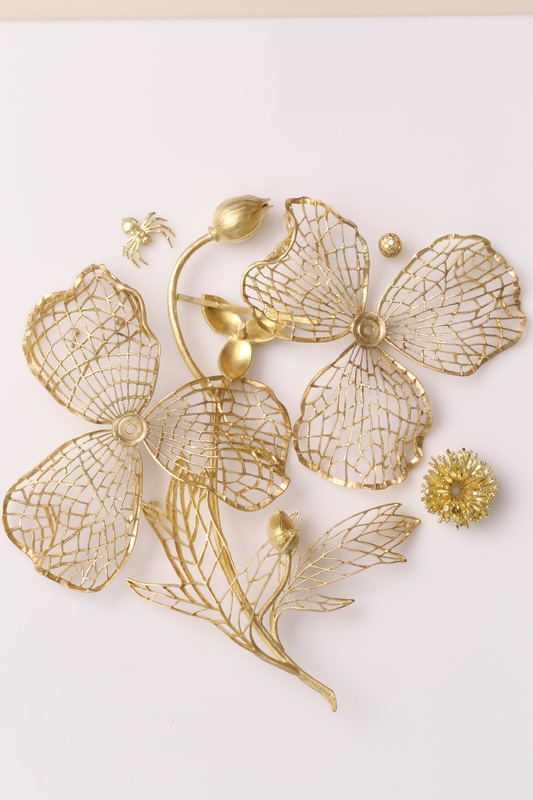 The Poppy will travel for many of Sotheby’s clients to take a look before the auctioning NY, Magnificent Jewels, April 17, 2019. Matilija Poppies, Romneya coulteri, are crepe papery white flowers with sunny centers that bloom as large as your open hand. Come late spring and early summer, the Mendocino Art Center (MAC) always boasts a stunning display of the show-stopping, statuesque California natives. Famous for being hard to grow, the care of these persnickety perennials can be tricky. 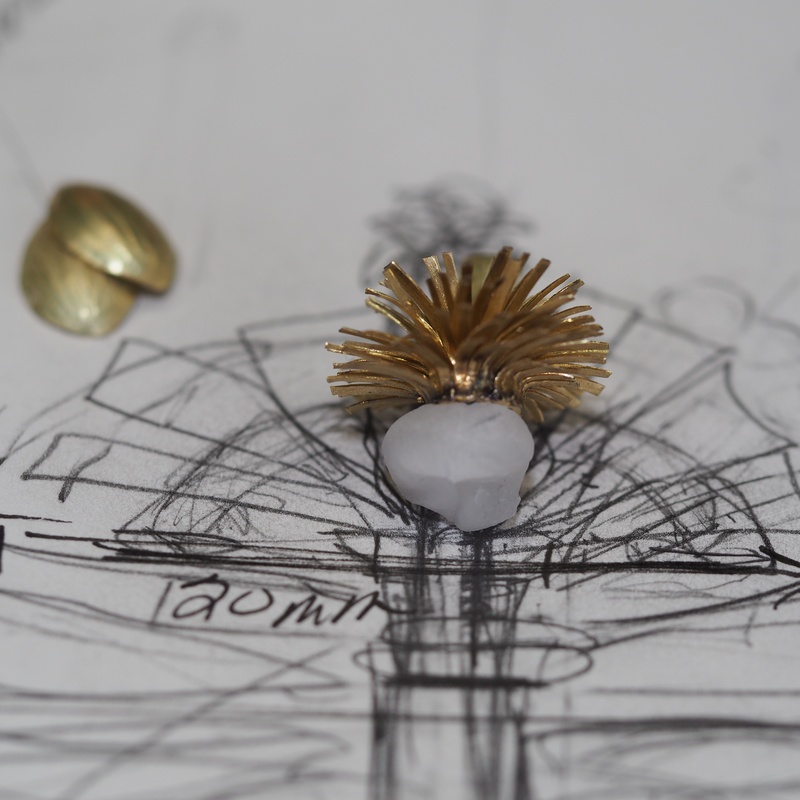 For all of these reasons, the Matilija Poppy proved to be the perfect muse for a budding project conceived in 2015 by MAC Jewelry/Metals Coordinator, Nancy Gardner, and my friend and colleague, acclaimed jewelry artist Tom Herman. 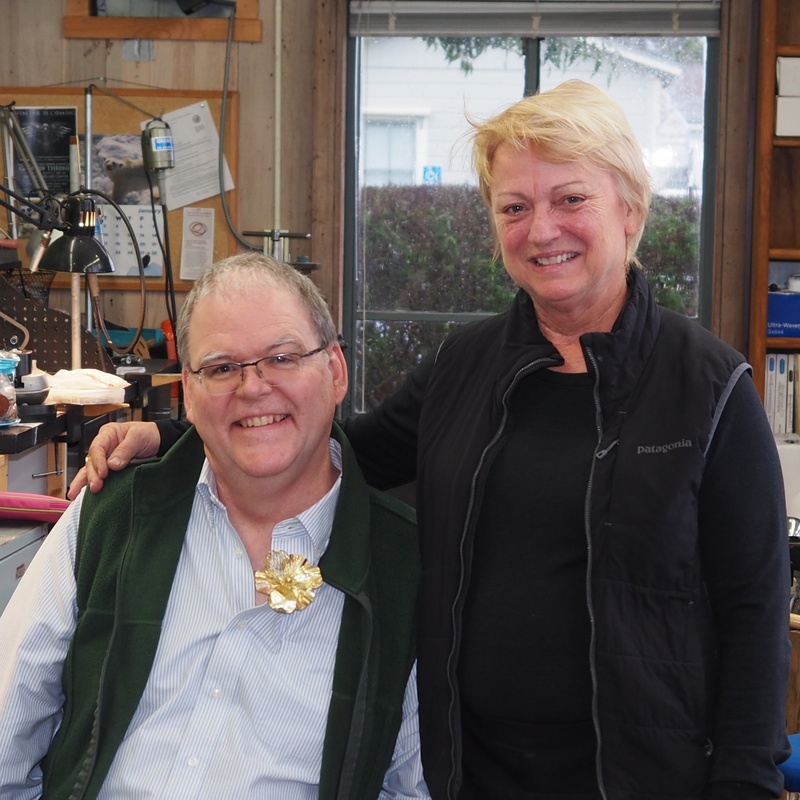 Together they envisioned Tom leading a hands-on jewelry crafting workshop that would lead participants into collaborating on a piece, which would be auctioned to benefit the Mendocino Art Center. 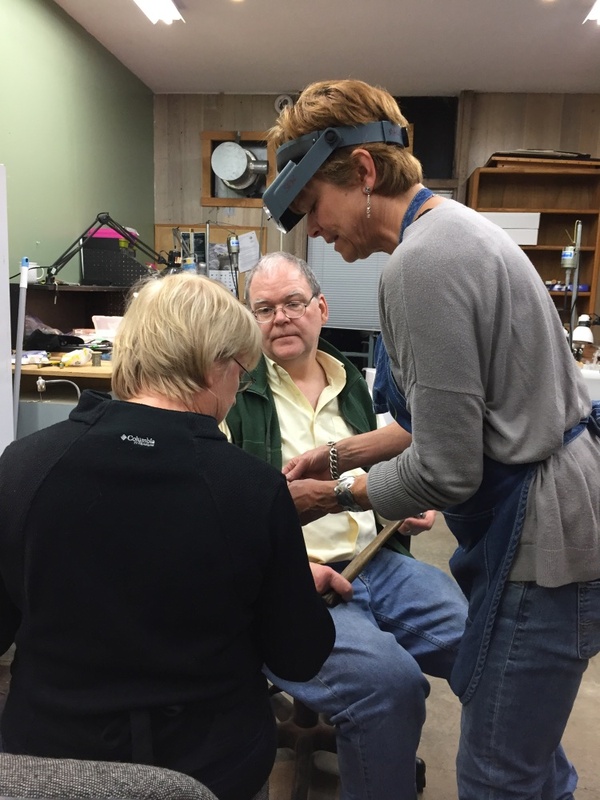 Tom immediately thought of me to join him in this endeavor, contributing not only plique-à-jour enameling to the piece but also to instruct a workshop at MAC on the process. 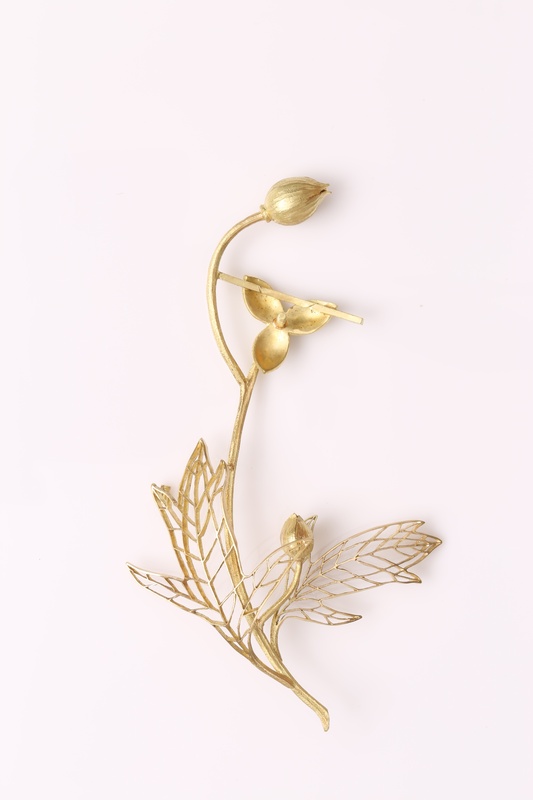 The roots of our desire to work together on such a project went back to late 2011 when we simultaneously fell madly in love with an incredible example of plique-à-jour jewelry: The Ada Brooch. 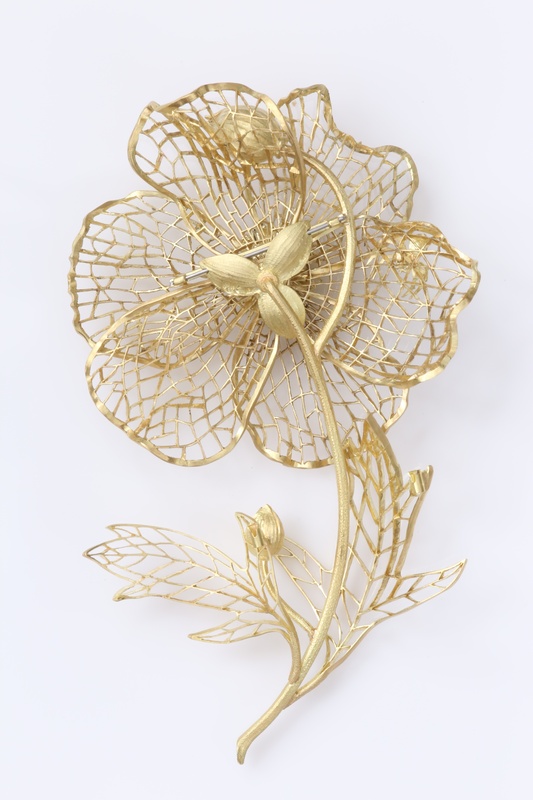 Tom first viewed Ada Rehan’s Morning Glory Brooch, created by Marcus & Co., when he participated in the International Art Jewelry Show at the Forbes Gallery in NYC in 2011. He called me and said this is a must see. Of course, I flew to NY from Dallas. The jewel was hung on a pedestal in low light and was unforgettably astonishing. My regret was they did not allow any photographing, after standing at the display window for 10 minutes I was shooed on and left felting a bit empty. 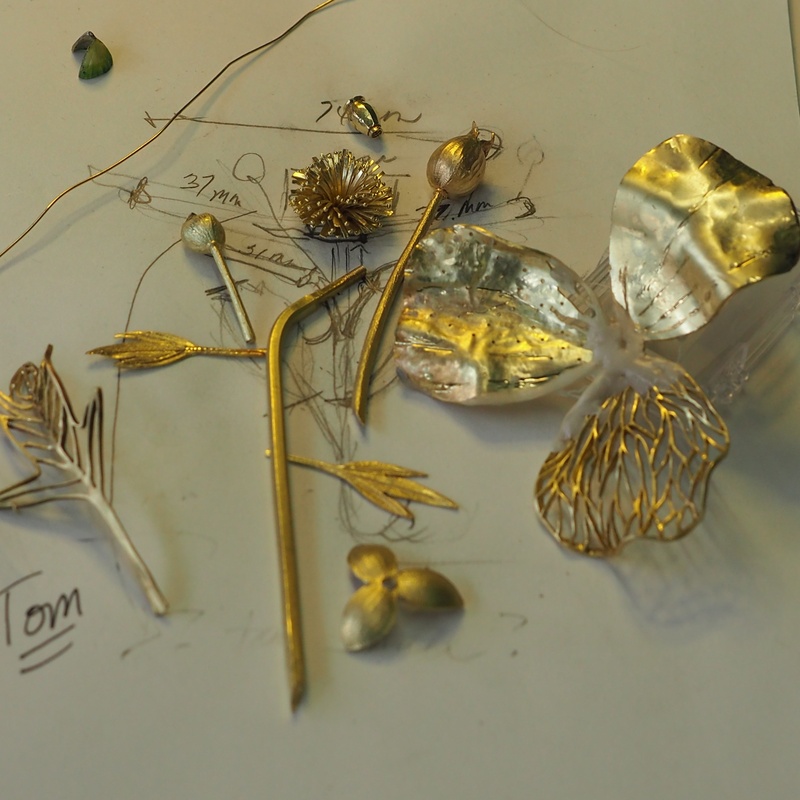 The show ended and the Morning Glory Brooch moved on, but Tom and I never forgot it. 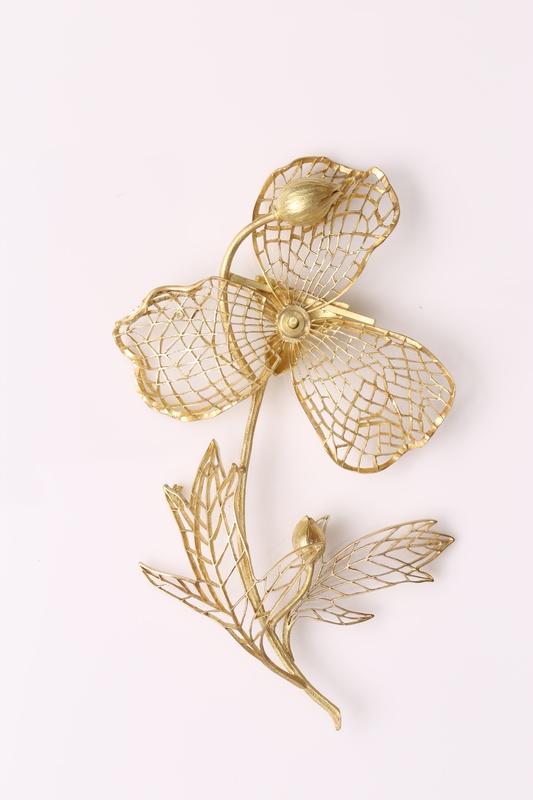 When the Newark Museum purchased the Morning Glory Brooch a couple of years later, they renamed it The Ada Brooch. At the turn of the century, Marcus & Co. was the gold standard for art nouveau jewelry and was known for their plique-à-jour brooches. The Museum purchased the Ada Brooch not only because of its unique and unseen style in plique-a-jour, but also because Marcus & Co. began in Newark. When we became aware of its new home, we told Ulysses Dietz, the Chief Curator of the Newark Museum, of our interest. 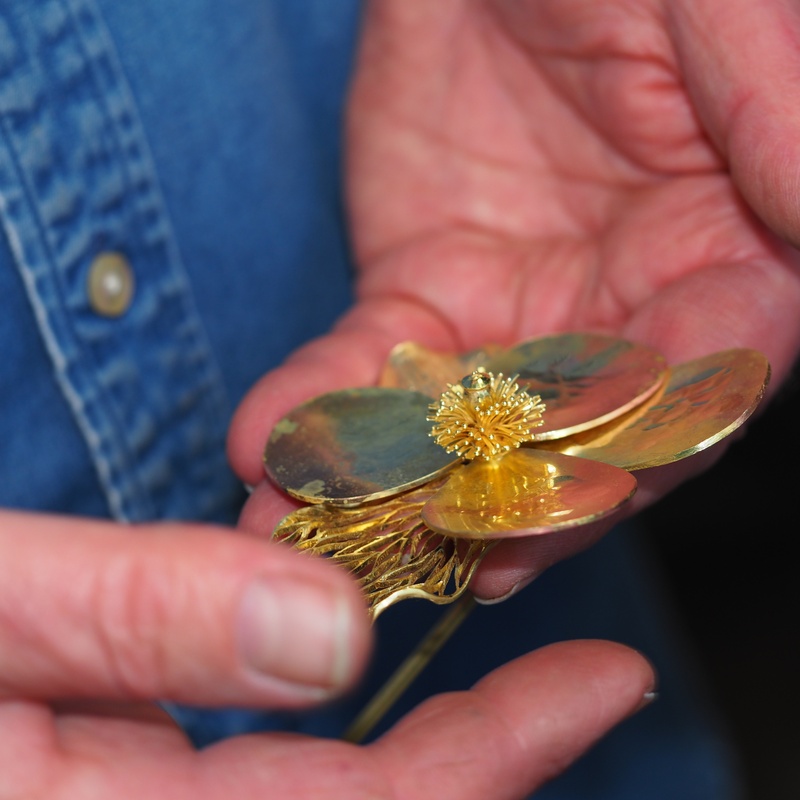 He was kind enough to have us visit and view the brooch first hand. And I mean first hand…. 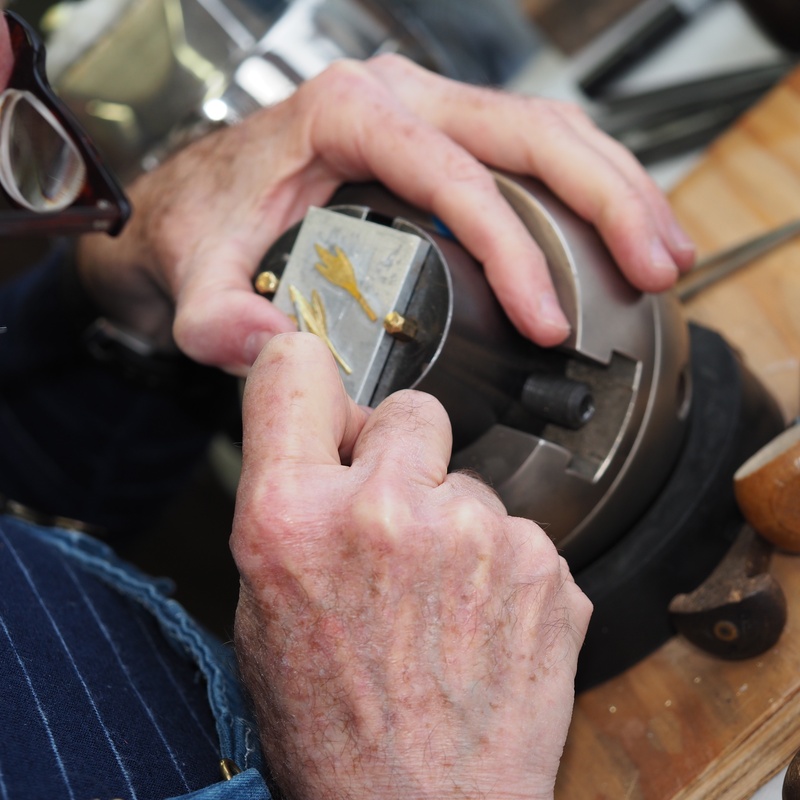 In our hands, this amazing jewel changed our lives as jewelers. 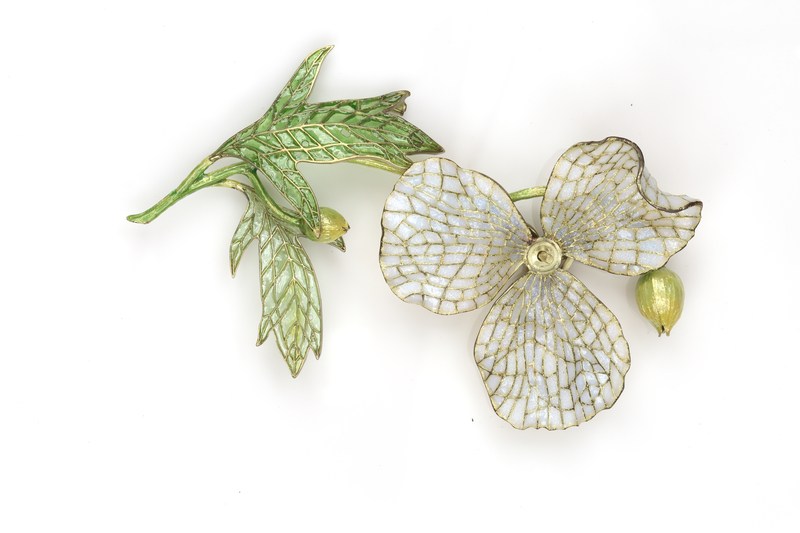 The Brooch is without a doubt above anything else Marcus & Co. had ever created, so beautifully crafted and intricately enameled, with mind-blowing articulation. Lyrical and stunning, the structure shows no signs of stress. 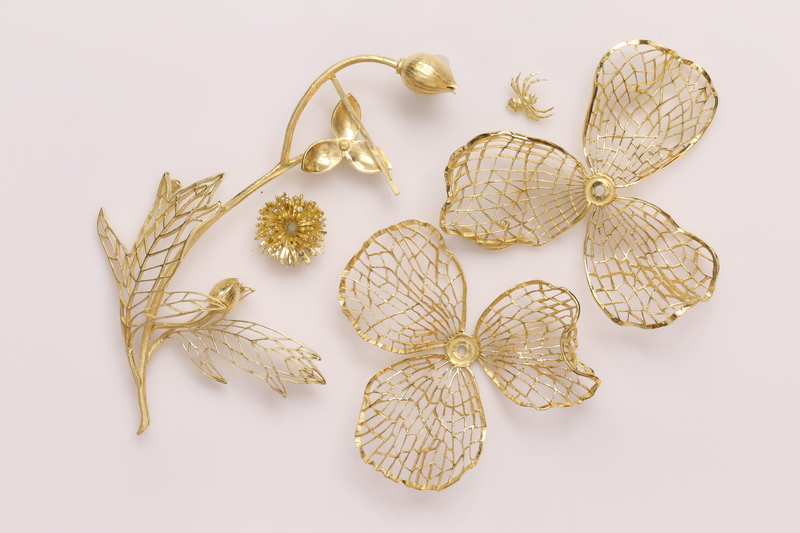 The colors of enamel flowed softly and gently along the forged and chased gold stems and buds. 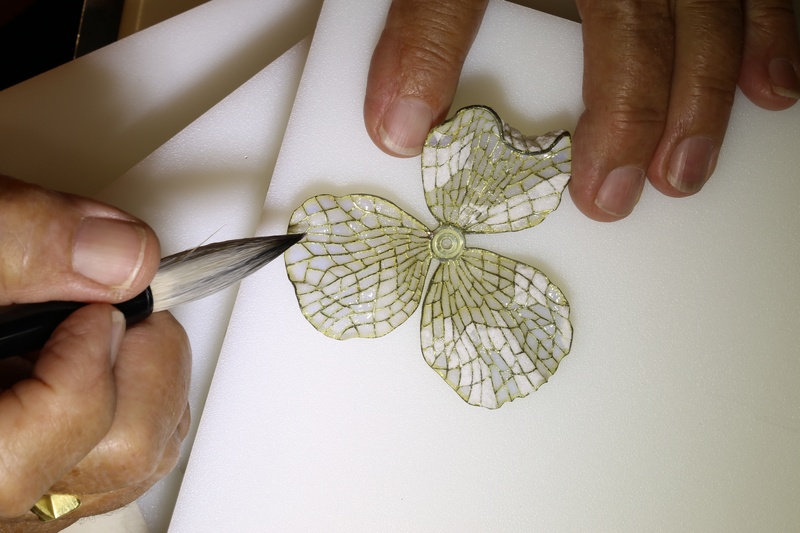 The three dimensional flowers and leaves allow the light to shine through to enhance the color of enamels in this plique-a-jour beauty.While filling large open cells on reoccurring surface curves, the artist accomplished an outstanding feat! 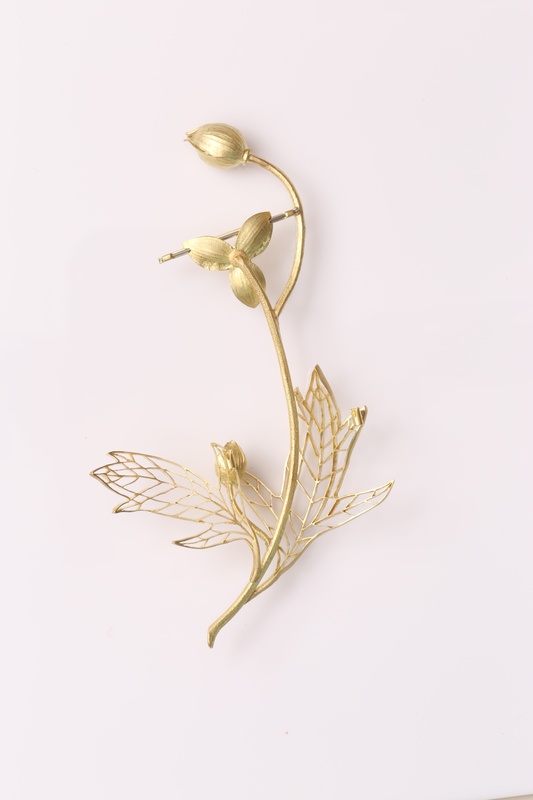 You can view detail photos here https://alohilanidesigns.com/the-ada-brooch/As makers, Tom and I became obsessed with the construction of this piece, captivated by all the details from how languidly it moved to its unbelievable integrity and apparently stress-free structure, for going on a century. 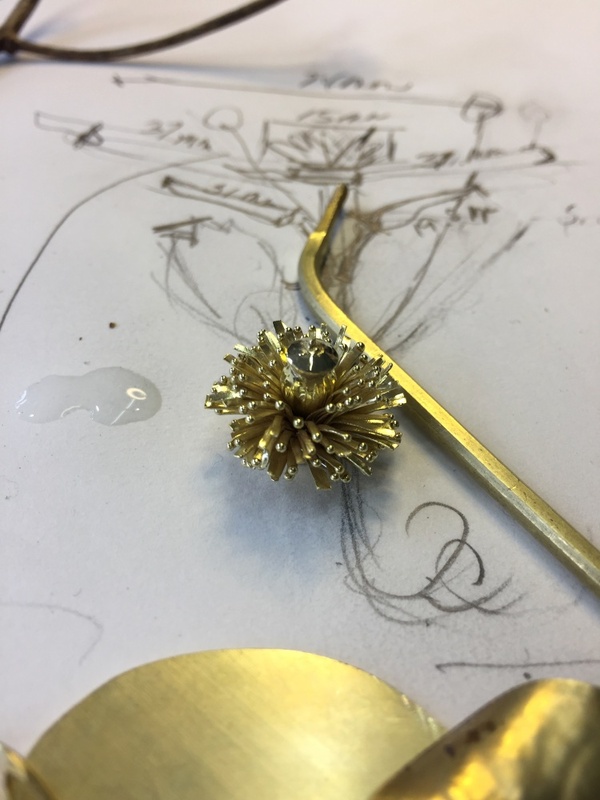 We researched its history as much as possible, and added to our own educated estimates that it must have taken between five and seven craftspeople in the Marcus & Co. atelier to bring the Ada Brooch to life. 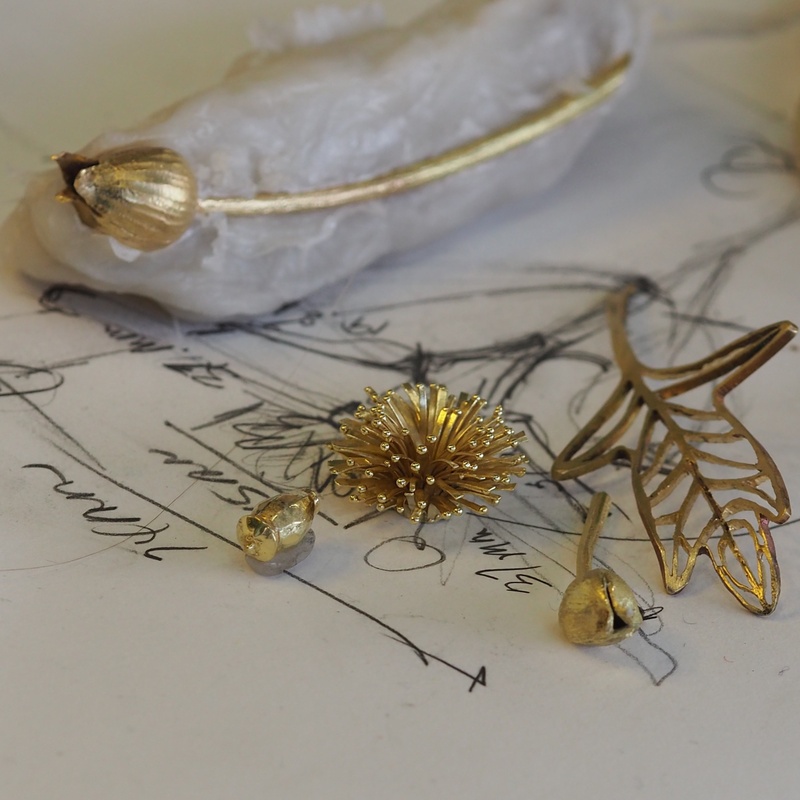 It would take a collaborative process to devise something so complicated, and yet so elegant. 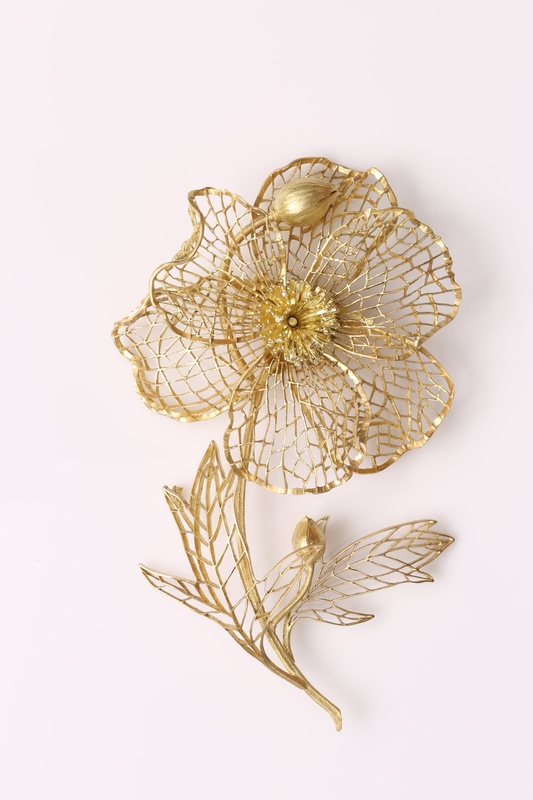 We entered, the Matilija Poppy Project – and Challenge – to faithfully follow the Ada Brooch’s example to create a three-dimensional, plique-à-jour piece. And accepted! 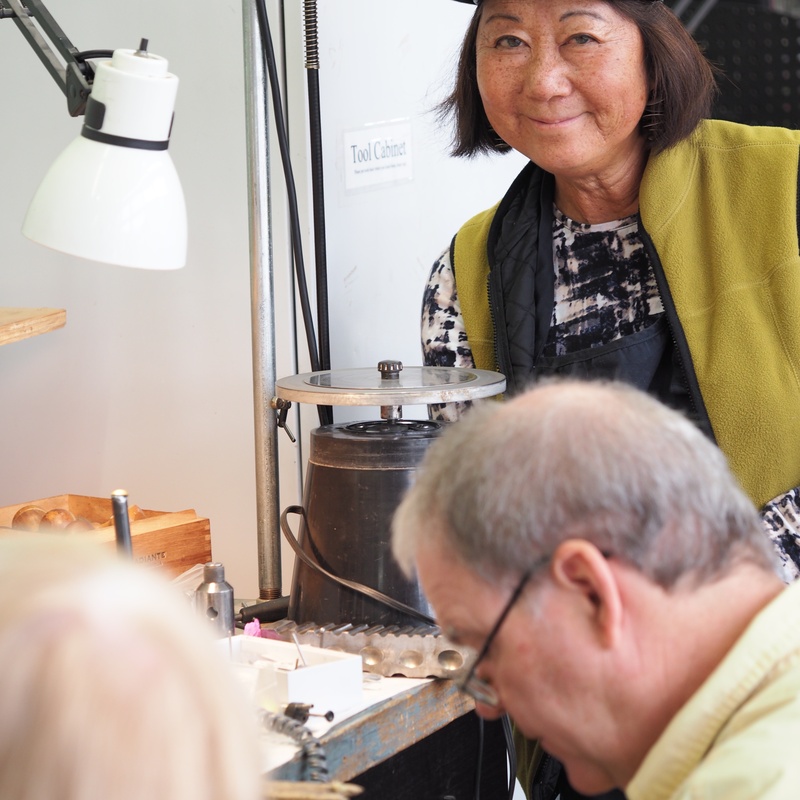 With all the artists going to the MAC for the workshops, we had our “atelier” of craftspeople. While it might be nice to picture a balmy summer day with our crew basking in the inspirational glow of a sea of Matilija poppies to kick off the project, the truth is the MAC workshops commenced in January 2017 in a swirl of wild winter storms that brought downed power lines, closed roads, and severe flooding. 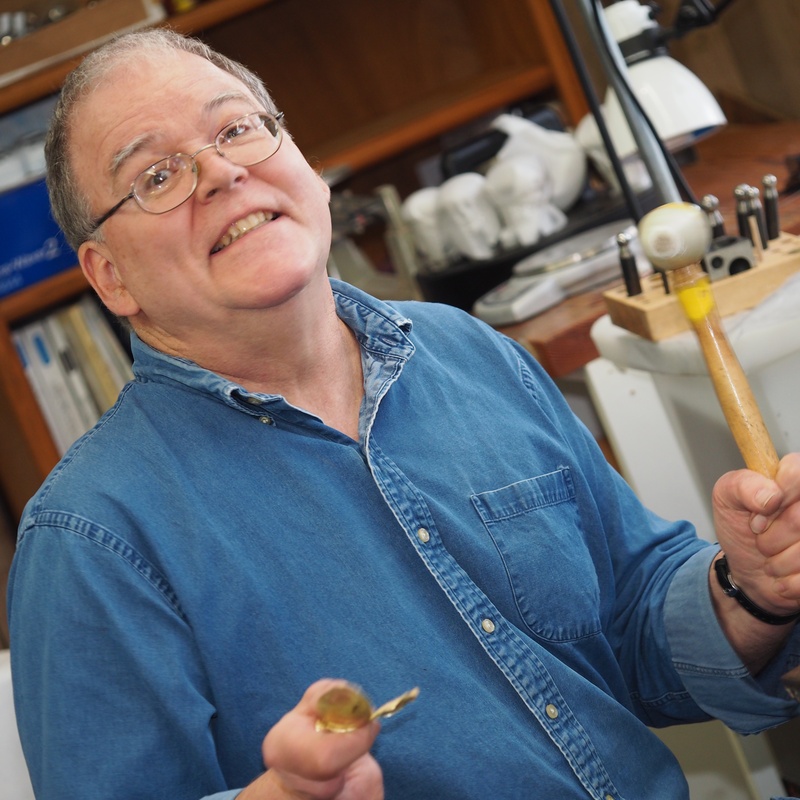 Still, nothing dampened the enthusiasm of a dozen metalsmiths and eight enamelists, who immersed themselves in our workshops where we taught the techniques of carving, chasing, saw piercing and enameling plique-à-jour. 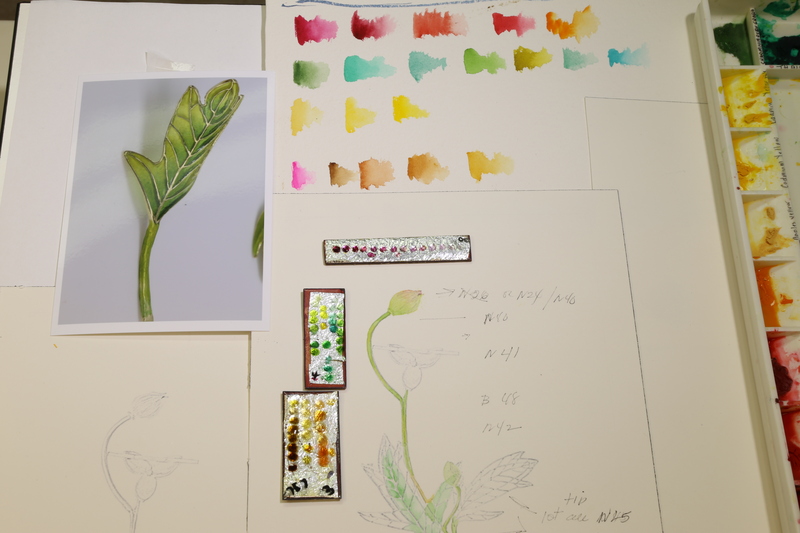 Ideas and enthusiasm flourished to shape the early design phases of the Matilija Poppy. 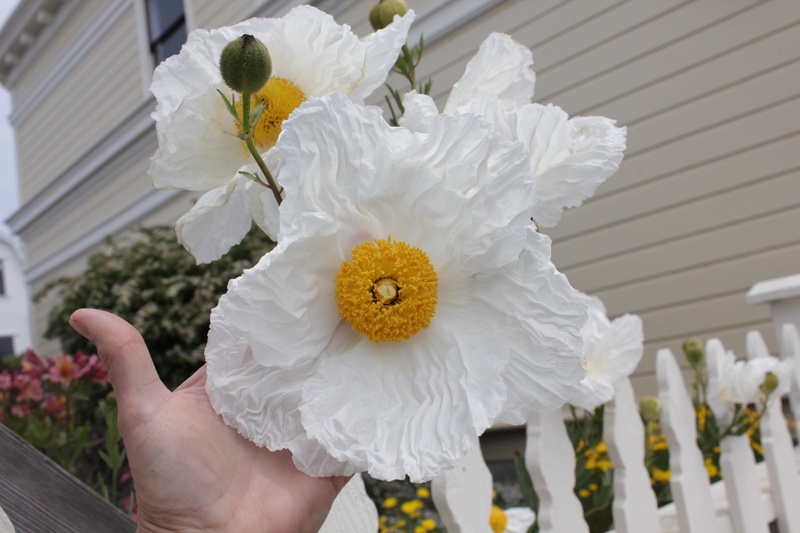 Picture this in your mind ~ petals of the Matilija Poppy are as lightweight as crepe paper, folding effortlessly over itself, large yet upright to the sun, elegance in natural form. It reminded us of the iconic Marilyn Monroe picture of her dress billowing around her. 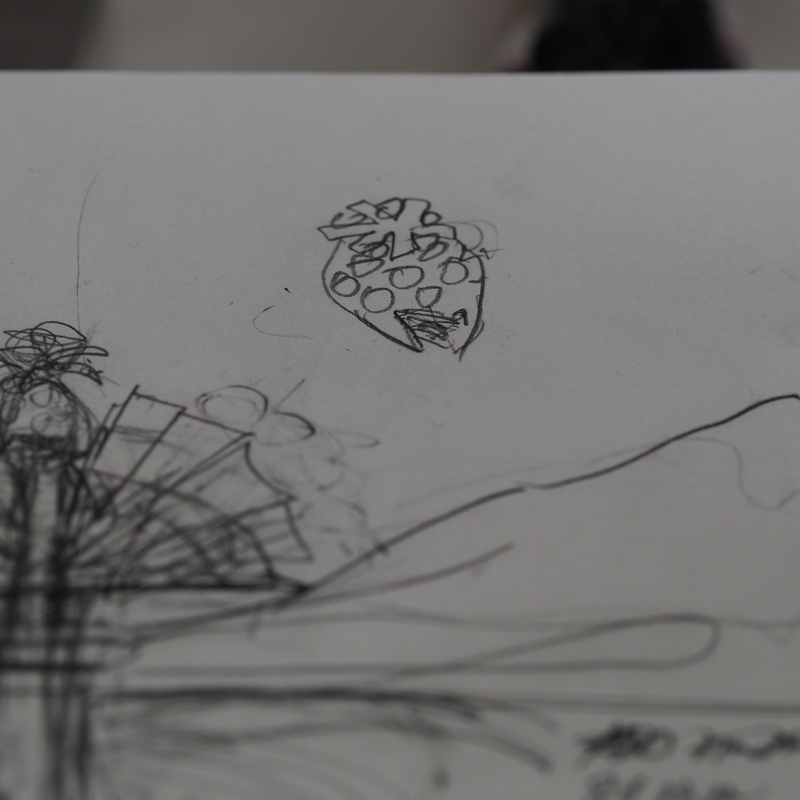 It was this type of fertile brainstorming that helped launch the project out of those Mendocino workshops. As Tom noted, at times there really is no clear path, all you can do is start and adjust as you go. 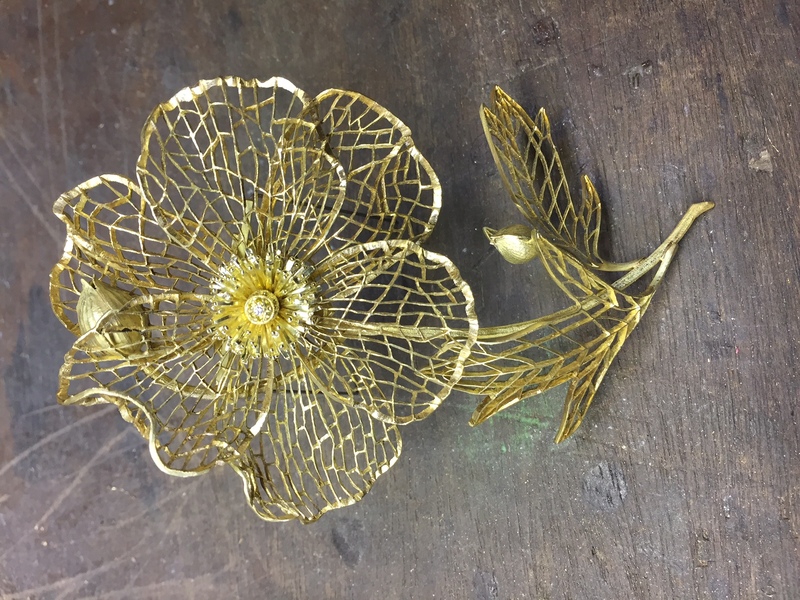 So, it became apparent that our biggest hurdle would be to translate the delicacy of this flower into a structurally rigid and secure piece of metal and enamel. With only a drawing in hand, next was a paper model. 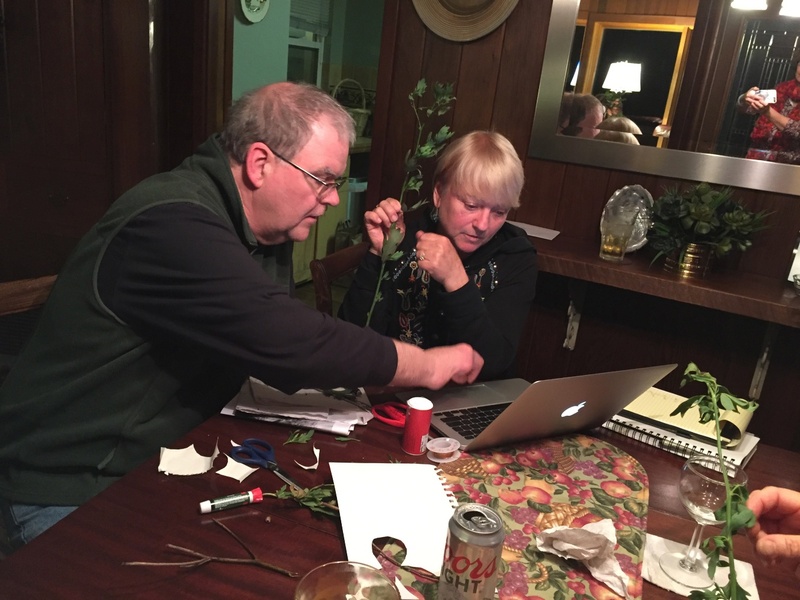 We had no flowers to work from, just photos, branches and twigs from the winter garden of Mendocino. 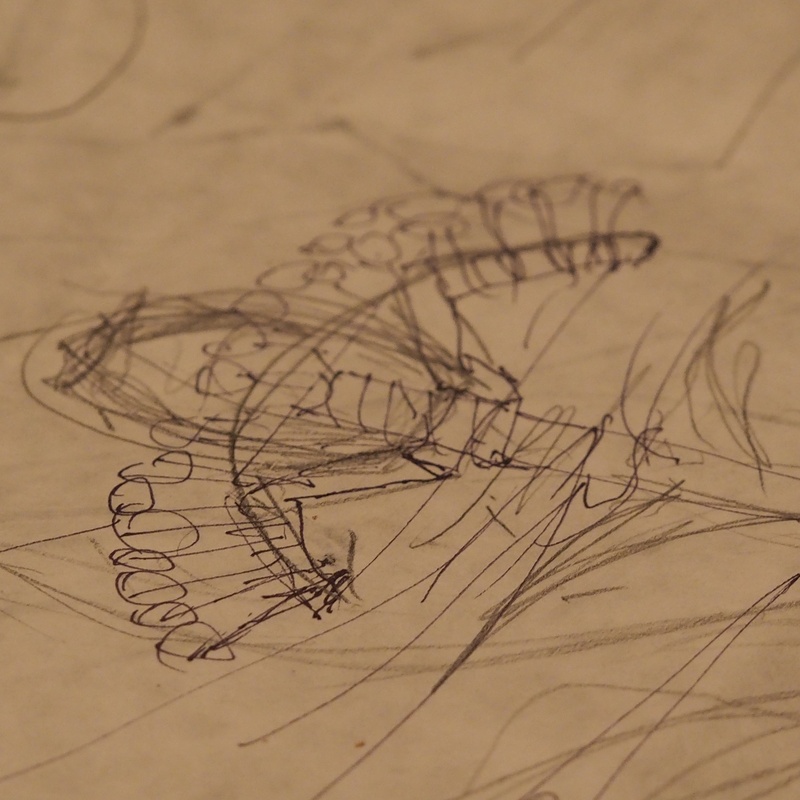 With this, we were able to begin creating the idea of what it would ultimately look like. 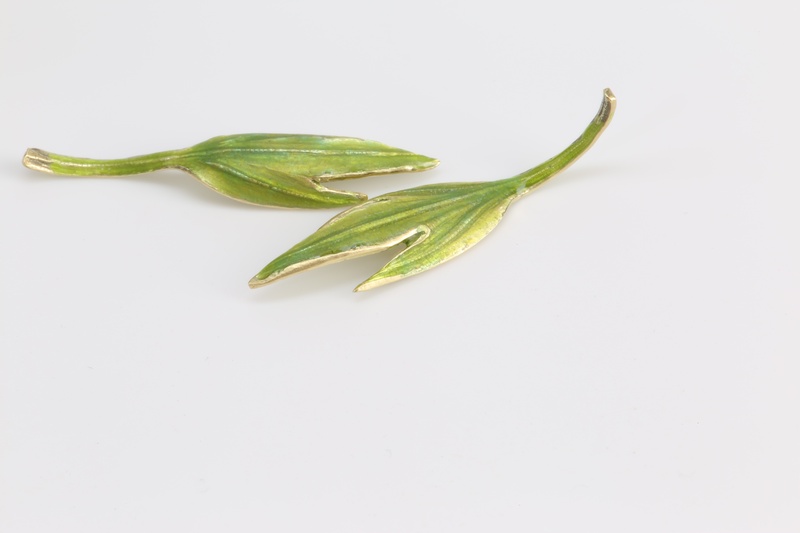 We knew it had to have a certain dimensionality and rigidity to be a wearable brooch. 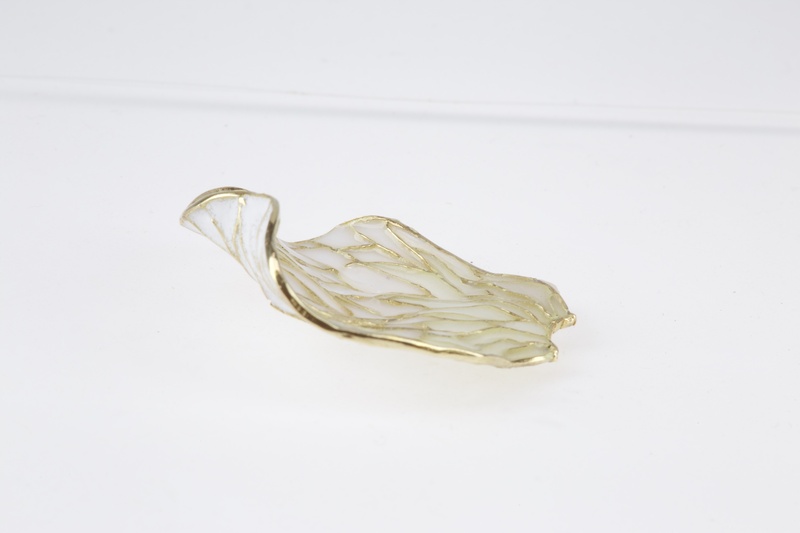 As was the Ada brooch which had lasted 100 years and reportedly had been used by children in adorning their Halloween customs. 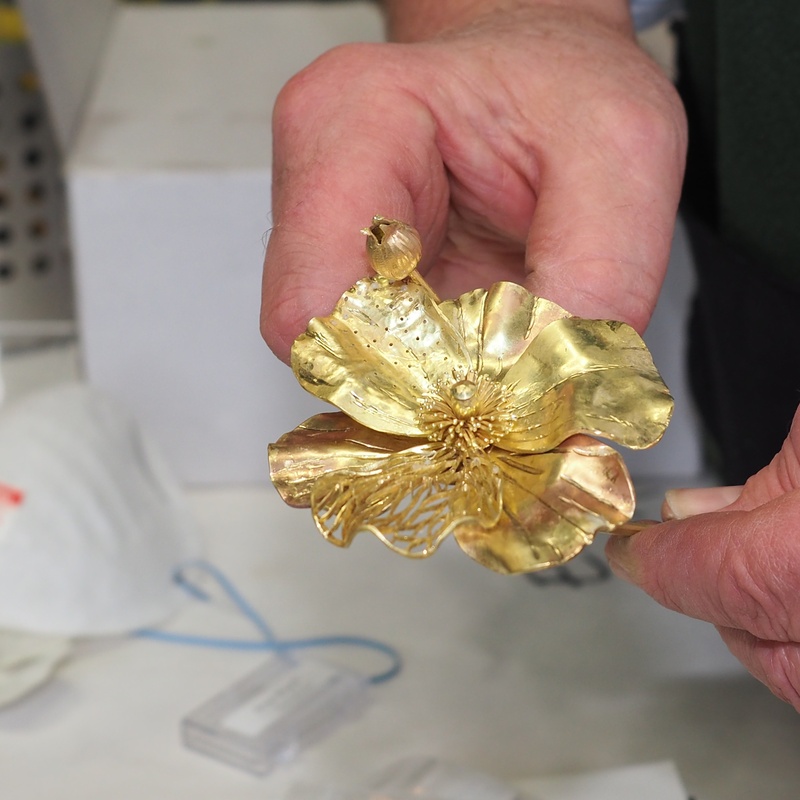 Viewing the Ada brooch, we noticed tiny supports between leaves, again a helpful hint with which to work. 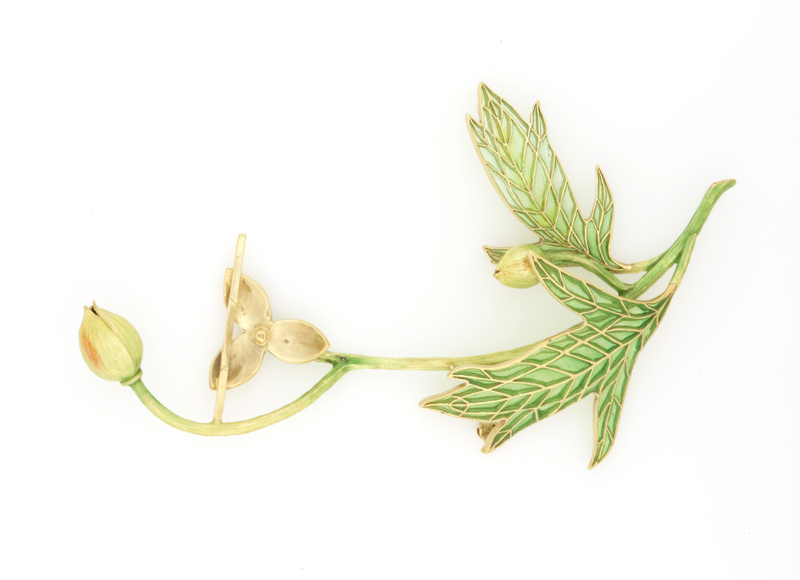 The bud placement became natural between the flower petals just as we find them in these magnificent growing flowers. 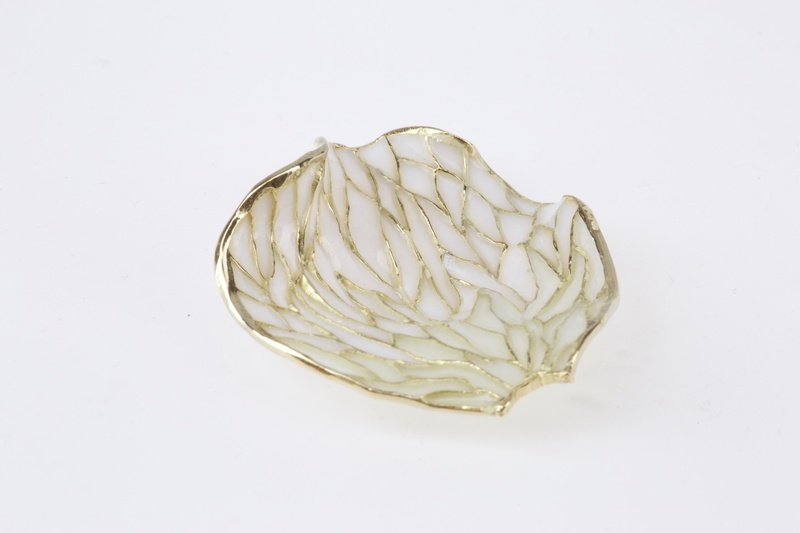 For two weeks straight, the lessons of the Ada Brooch were in full force. 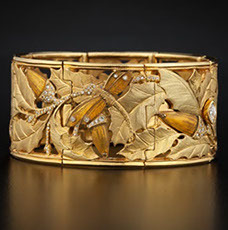 In the early 1900s construction of such jewels took many artists working on one piece to create such a masterpiece. In the last 50 years or so, the notion that an artist has to do everything solo is pervasive – and not at all true. 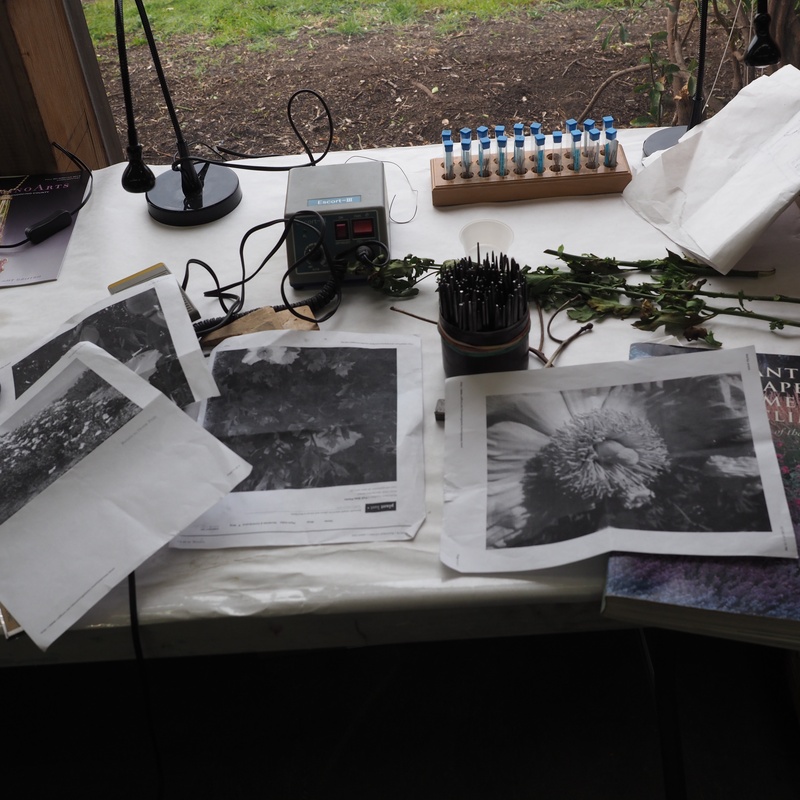 The Mendocino workshops were a powerful testimony to the collaborative process. A great example of this was the poppy’s stamens. 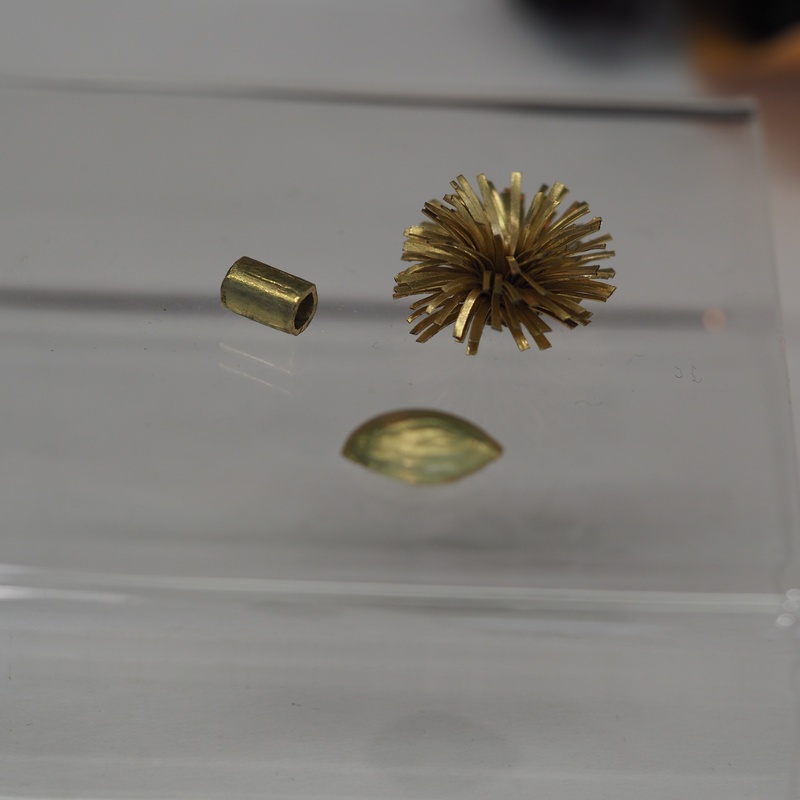 It was no easy trick to get those little spikes to stand just right, but one of Tom’s students, Dawn Nakanishi, had the perfect approach. 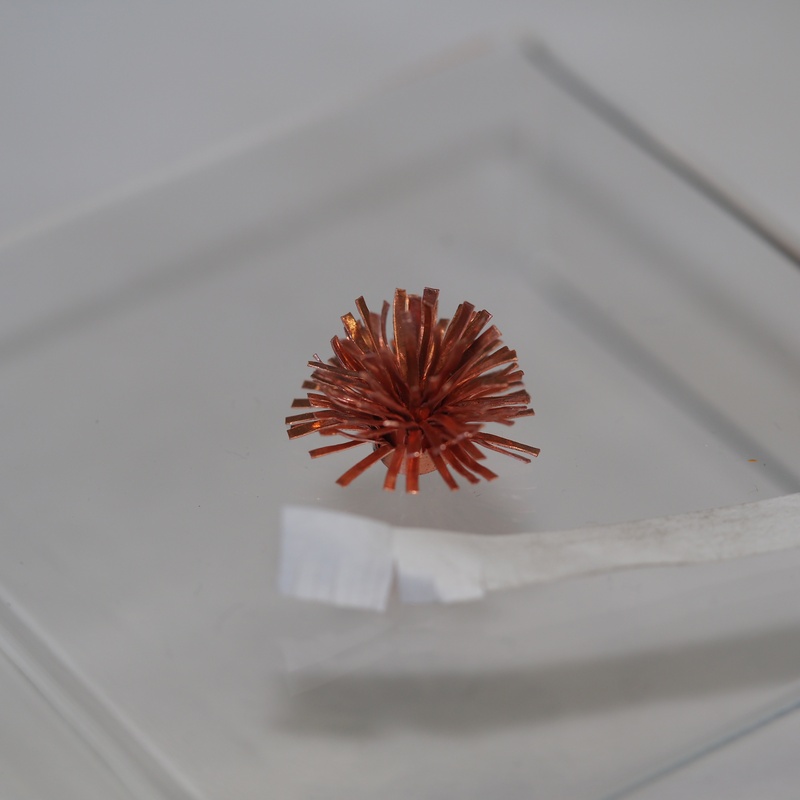 And it became a permanent part of the poppy stamen structure and will probably be in all our minds in future flower construction. 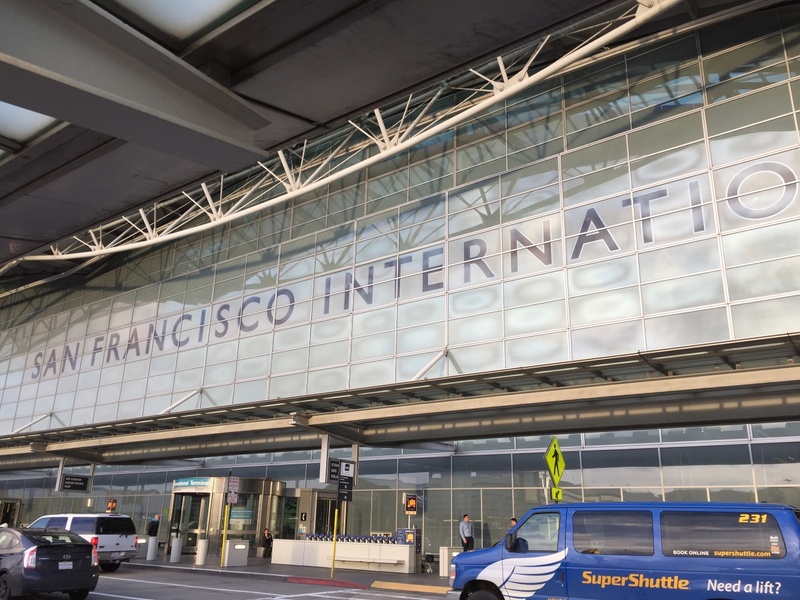 We covered a lot of ground during the MAC workshops, but by the second group week, it became clear that a piece of this magnitude was going to take more time than what we had in Mendocino. 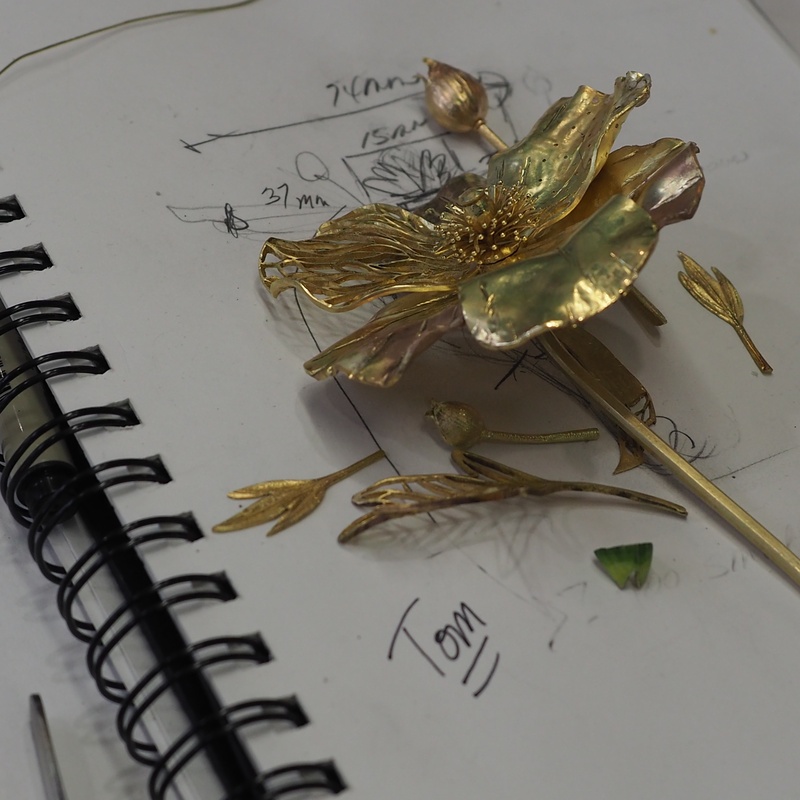 Returning to our own studios there were a few setbacks neither of us could’ve anticipated – for which, once again, the Poppy Project proved to be the perfect solution. 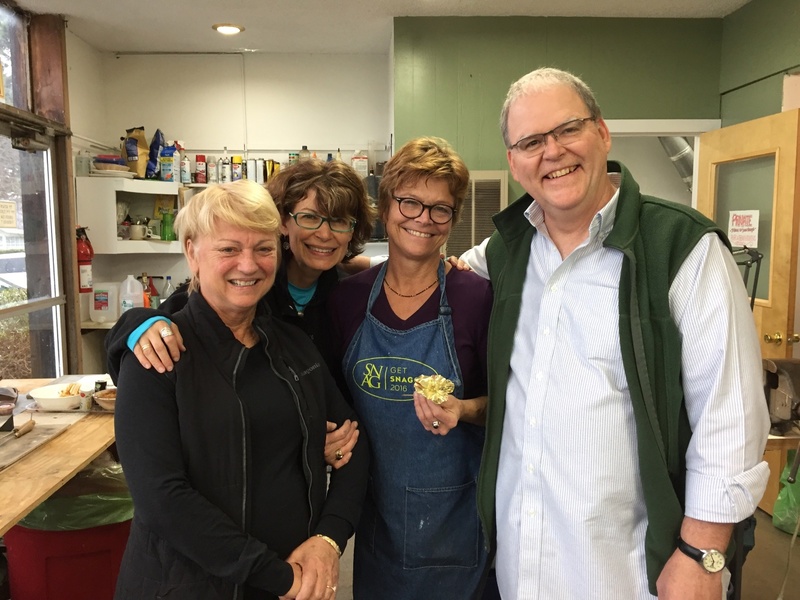 While we were in Mendocino, Tom felt like he might be developing a sinus infection. When he got home and things didn’t improve, he went to the doctor – and received a devastating diagnosis of non-Hodgkin lymphoma. Less than 10 days after returning home, he began aggressive chemotherapy treatments. 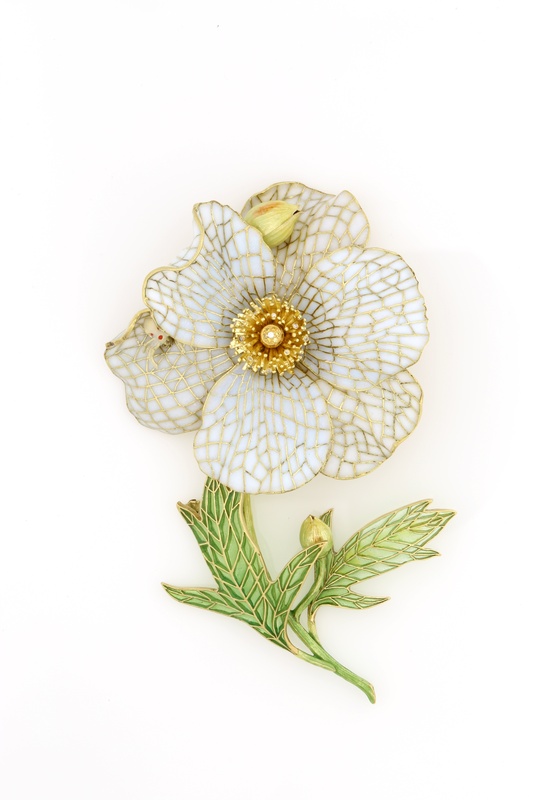 Tom said that his passion for the Matilija Poppy Brooch was his saving grace through those dire days. 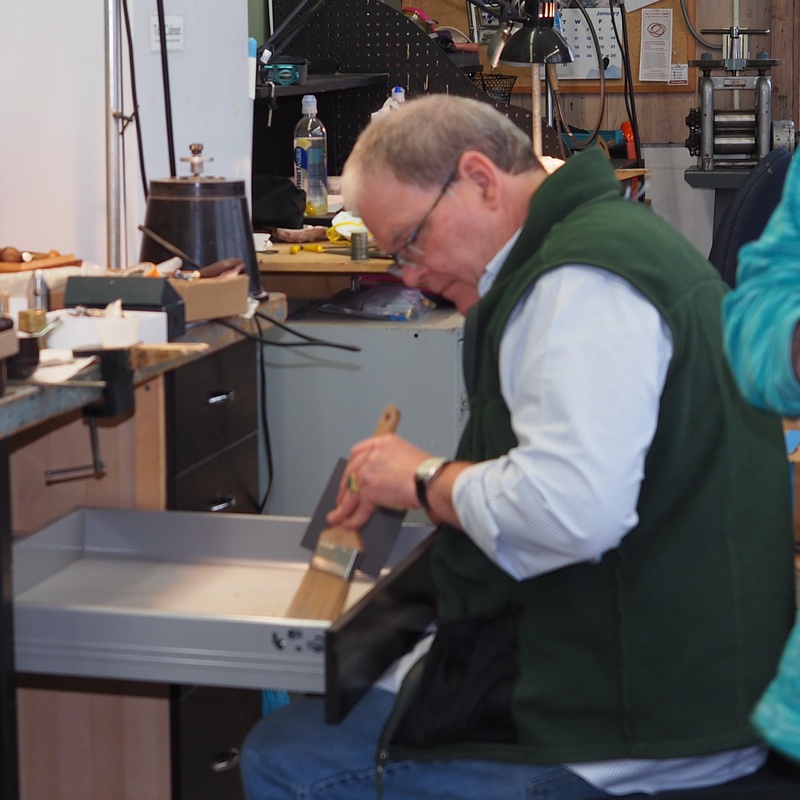 Even when he felt lousy, it was better to feel like crap at his bench, working on the project, than laying in bed. 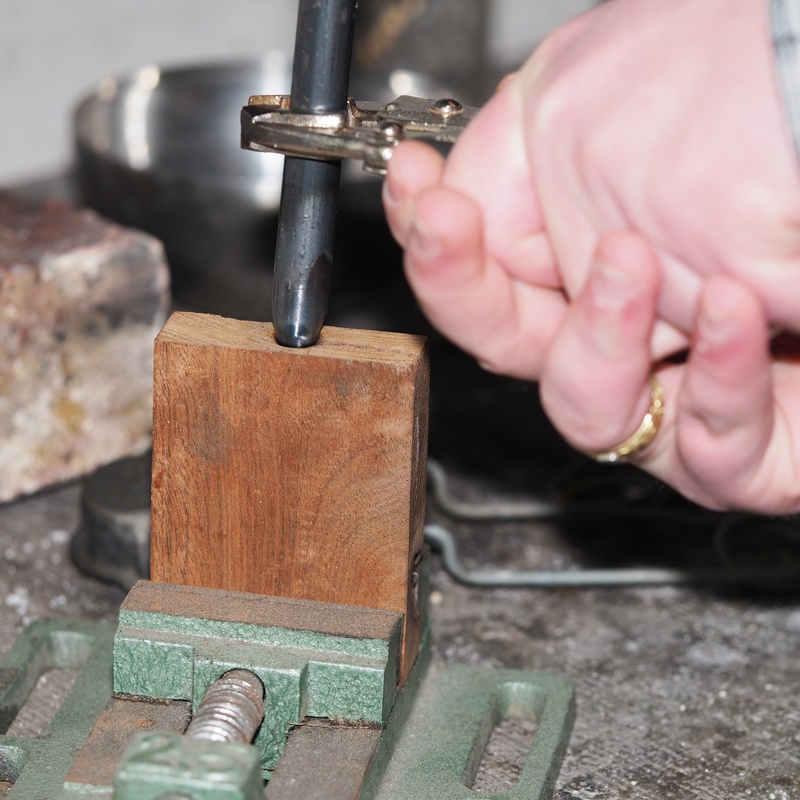 With the help of his son, Ethan, they continued, lots of saw piercing! 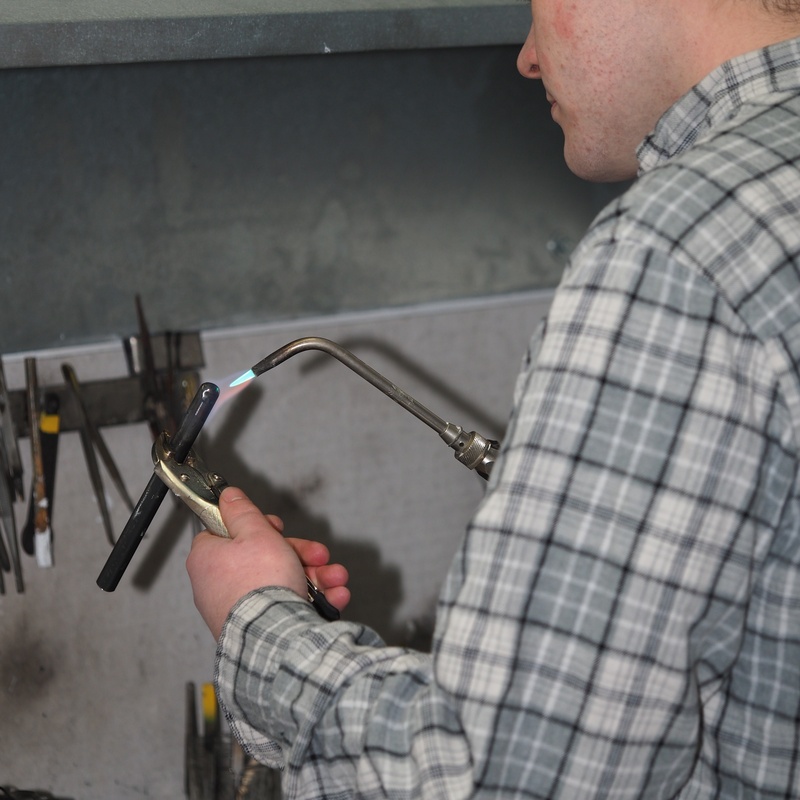 Tom then fused segments that could be disassembled for the enameling process and relatively easily reassembled. At this point, it was fall and time to ship the beautiful framework he’d created to me. 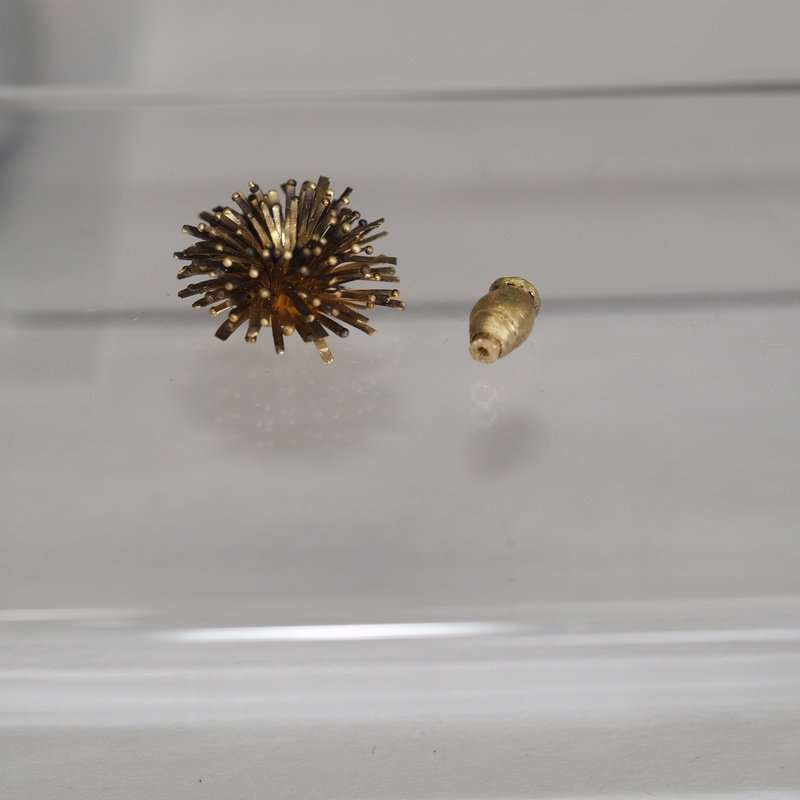 On my end, an old back issue flared up again, and I needed a cervical fusion shortly after I received the poppy from Tom. Like him, I’ve found that when I’m determined and have something other – and greater than pain to think about, it makes all the difference. 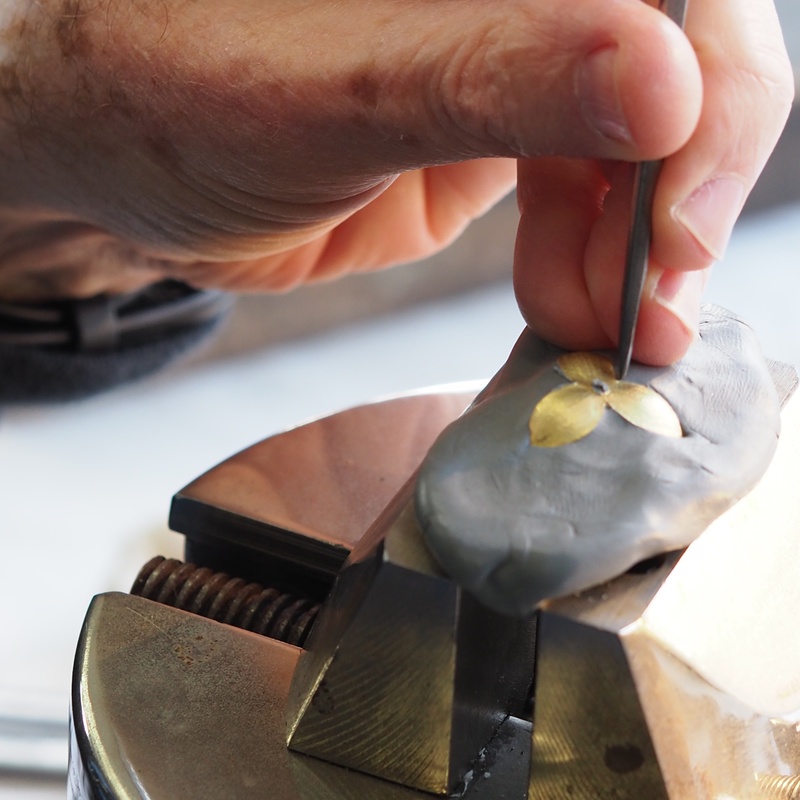 Spring brought renewed strength and with it, the poppy pushed me to a new level in my practice of plique-à-jour enameling. 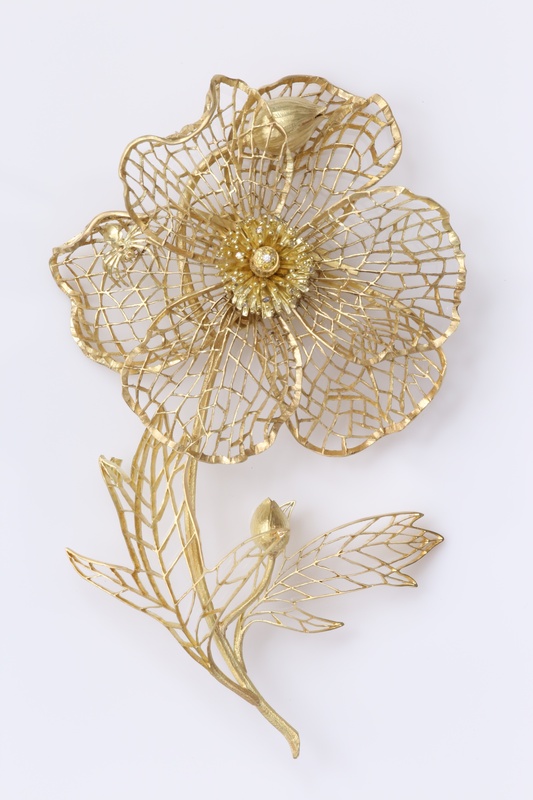 I could hear the voices of the old masters behind the Ada Brooch whispering in my ear, helping me figure out how to get just the right color combination to make the flower’s buds, leaves and petals come alive in all dimensions. Beyond the flower itself, we had also included a crab spider, which is native to Matilija poppies. Bob Weinstock was photographing the poppy for us for more references when we first noticed her. This sweet little girl we included is both a nod to the Naturalism Movement and also to the real spider who was peeking out from under the stamen of the live poppy we used as a model. 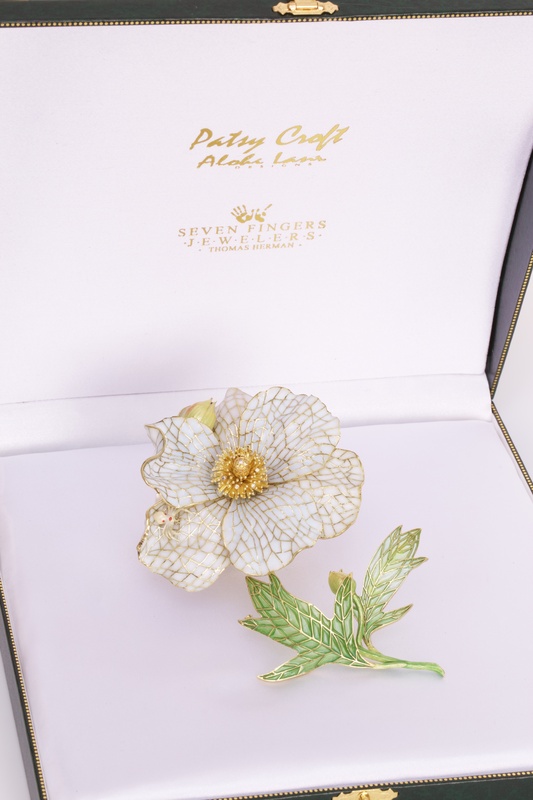 We completed the Matilija Poppy Brooch in October 2018, and are so grateful for the help of many fellow artists including Ethan Herman, Diana Casabar, Nancy Gardner, Bob Weinstock, Dawn Nakanishi and John Cornacchia. 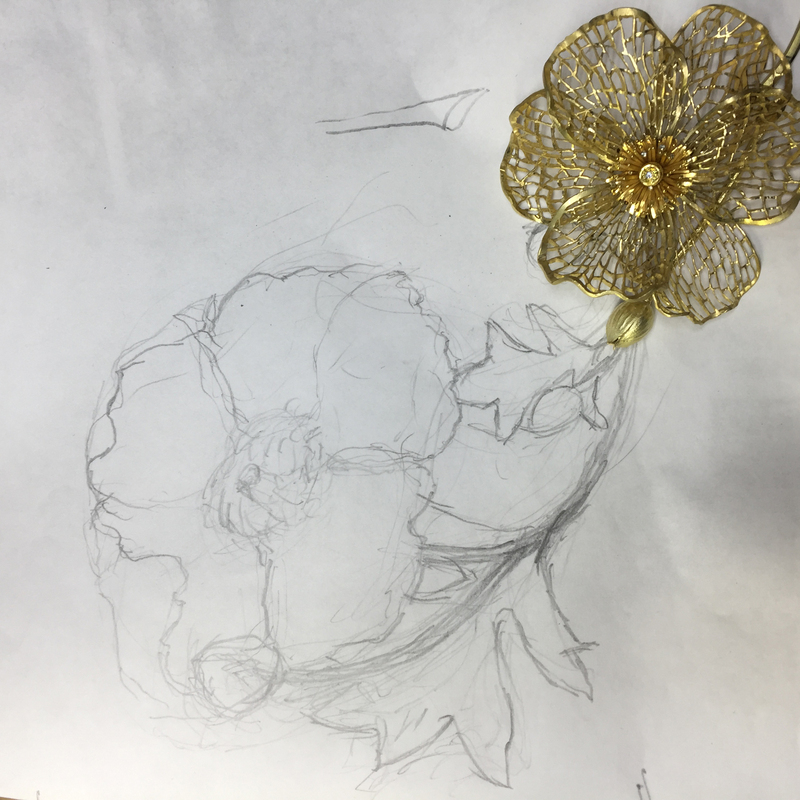 As it is with real Matilija poppies, it was at first tricky to figure out how to structure the piece – but in the end, it has proven to be a piece we are all so very proud of. 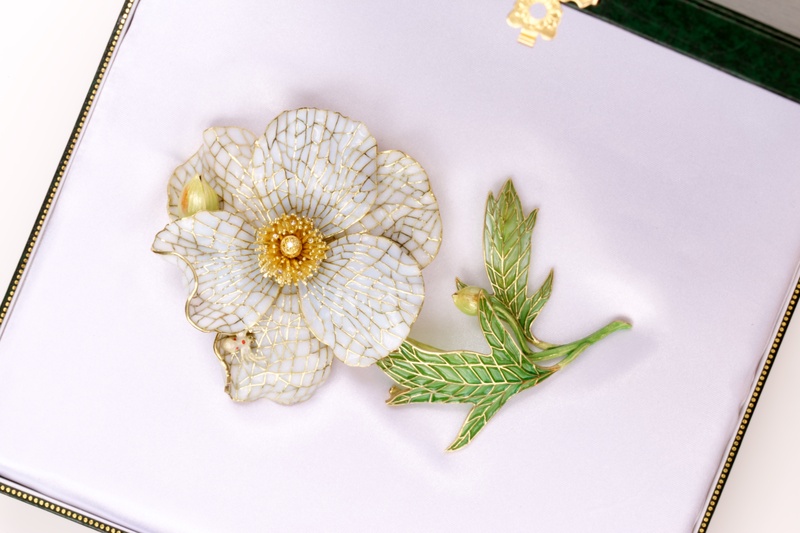 In the Spring of 2019, the approximately 3” x 5”, 18-karat gold with diamonds and fine plique-à-jour enameling, Matilija Poppy Brooch will be auctioned at Sotheby’s” Magnificent Jewel” Auction in New York City, ( Sotheby’s was also responsible for auctioning the Ada Brooch) with all proceeds to benefit The Mendocino Art Center. We are so pleased to support this gem of an organization. Please contact us if you would like more information about the Mendocino Matilija Poppy Project. 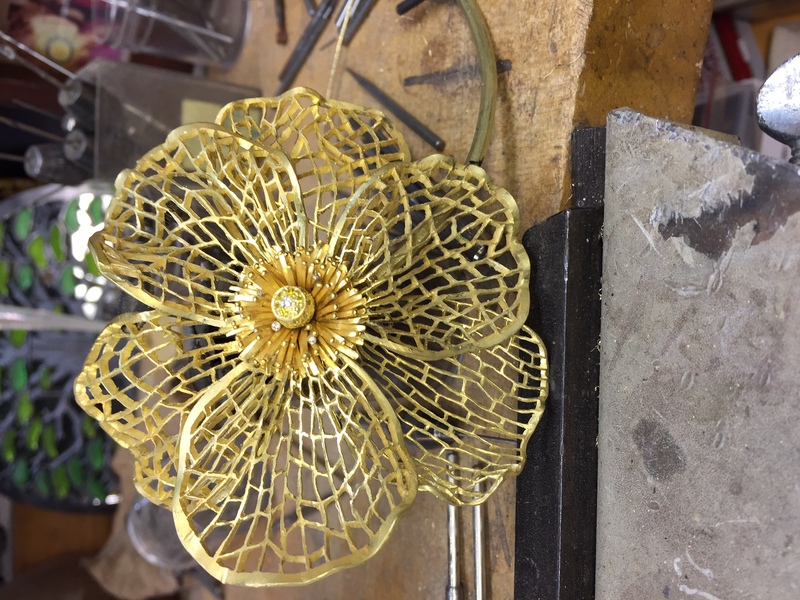 Visit www.alohilanidesigns/matilijapoppy.com for the daily activity that took place. 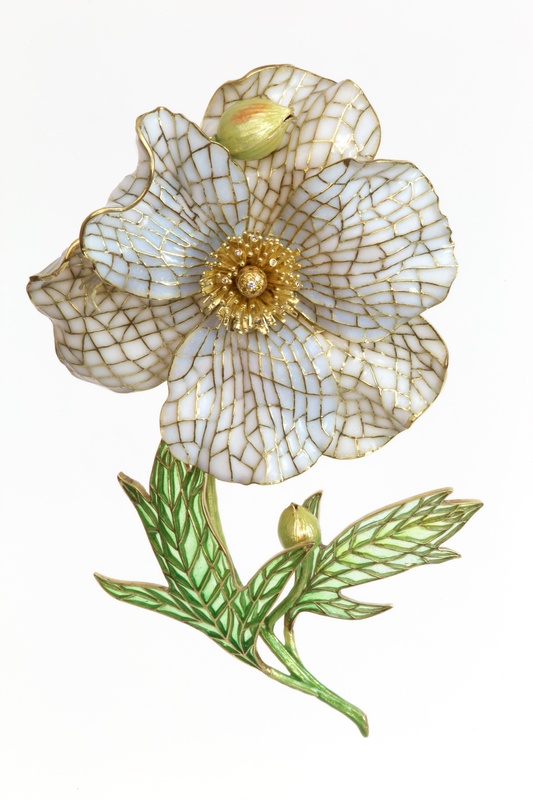 The Matilija Poppy Brooch is created here by Tom Herman and myself Patsy Croft for the benefit of the Mendocino Art Center. In our journey of studying the Masters of the past, we have come to realize the magnificent jewels of their time were not created by one. 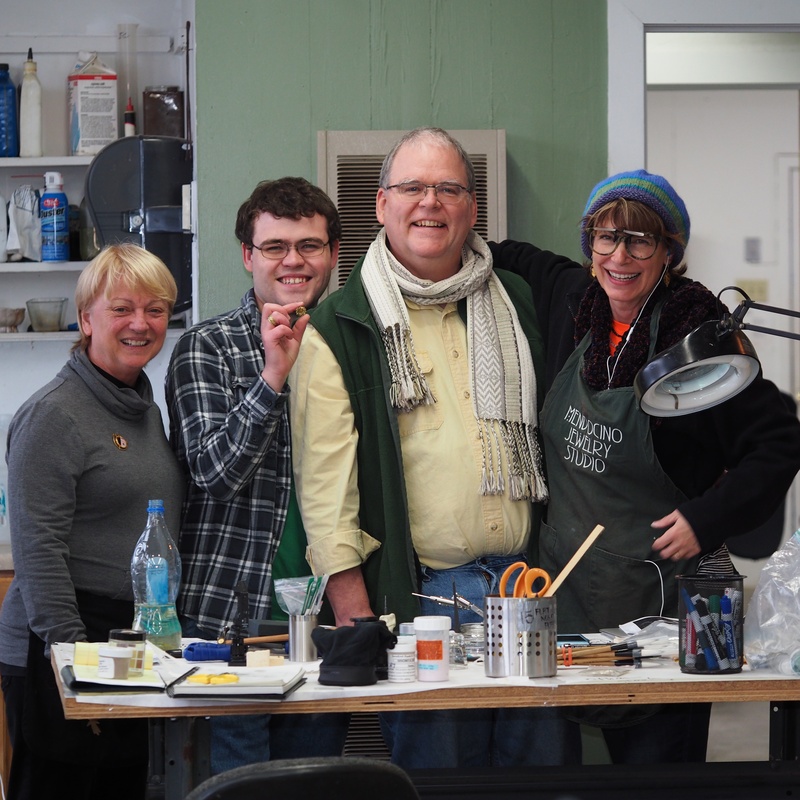 Contributing artist Nancy Gardner, Bob Weinstock, and Ethan Herman all play a large part in this amazing project. Stay posted as we share our journey. Gold for this project was donated by the Mendocino Board member John Cornacchia and the artists are donating their time to support the school. 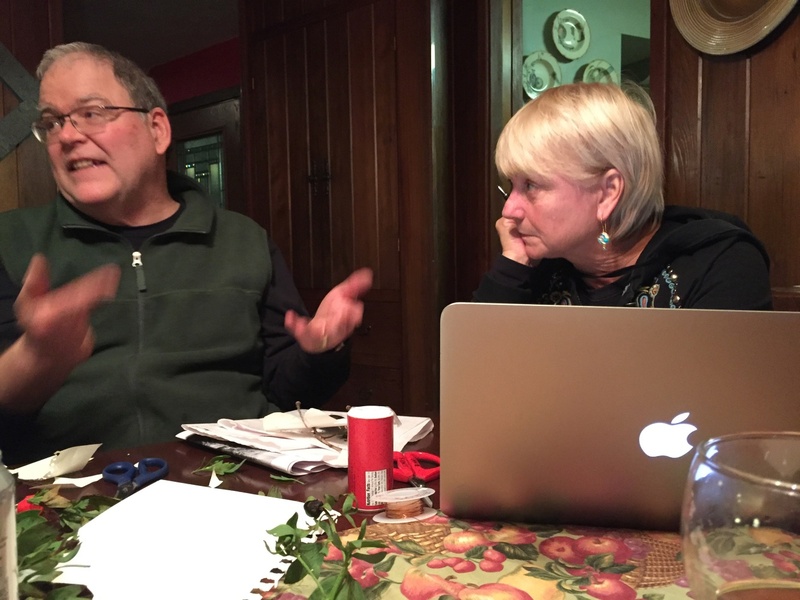 A weeks work with Tom Herman, Patsy Croft, Nancy Gardner, Bob Weinstock, Ethan Herman. 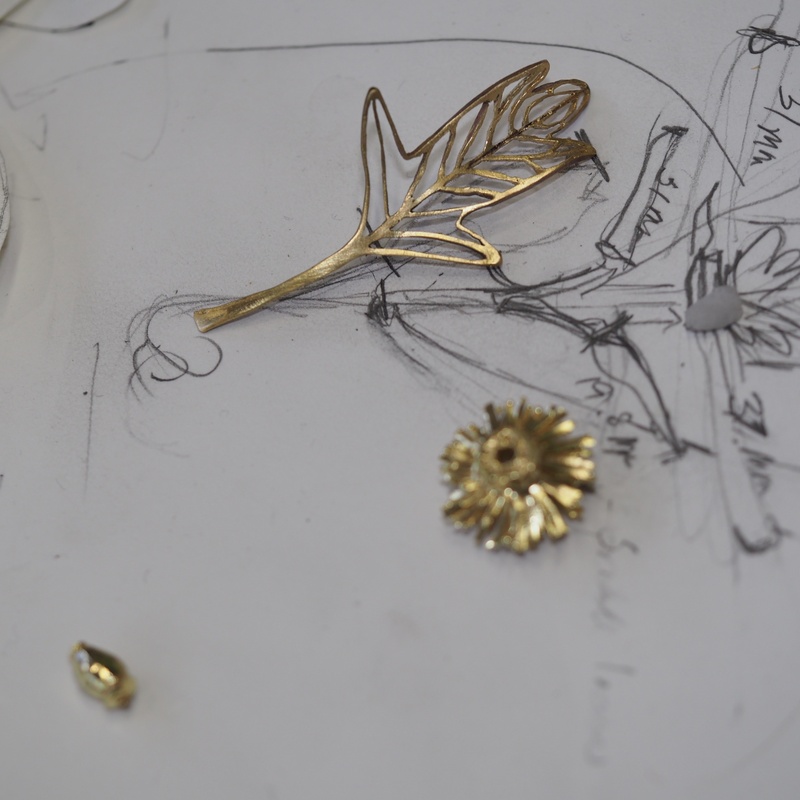 The Beginning.. this cute little part will become the stamens. Dawn shared this with us as one of her students had shared it with her. 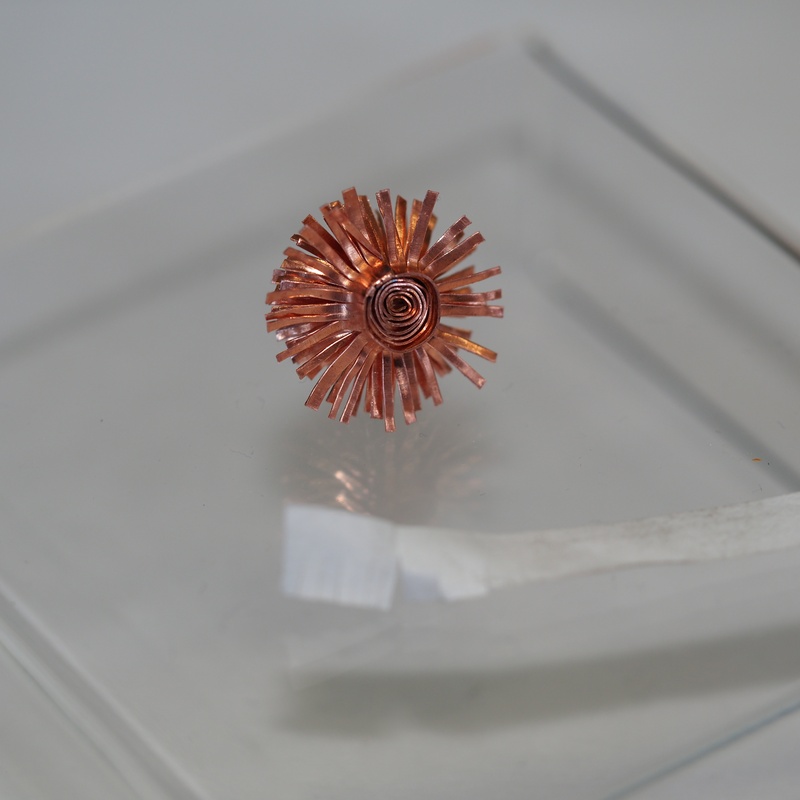 The tube will be placed inside the stamens and act as a bolt to attach to the stem. Now on to the buds. We have planned two unopened pods. Ethan was busy on this. 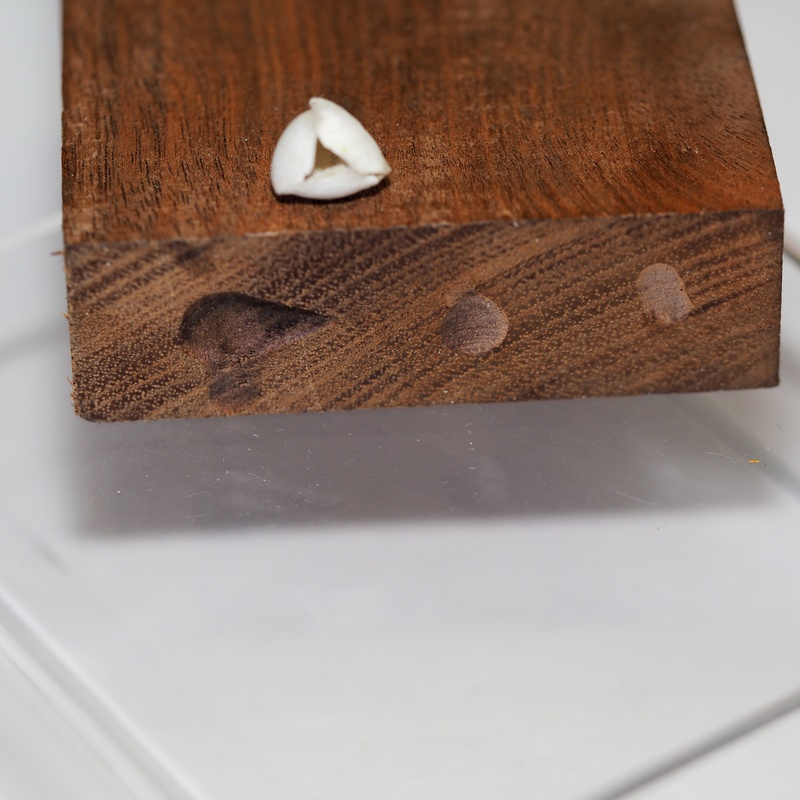 Here he made a form into the piece of wood after Tom made a paper bud as a model. You can see the two pod parts on the left. 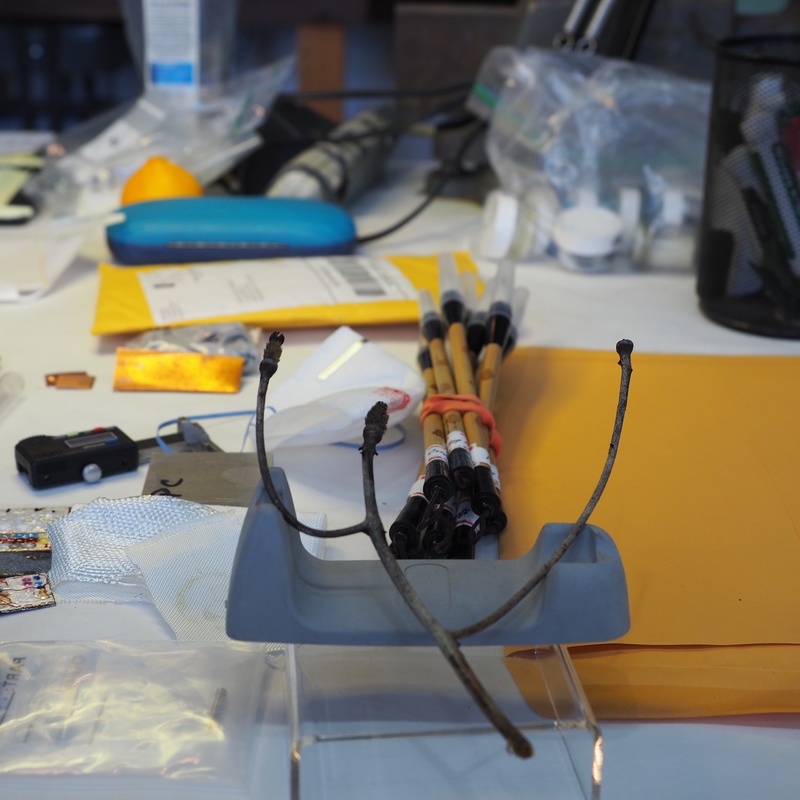 Pod parts assembled and ready to be chased by Master Bob Weinstock. Nancy busy making leaves, chasing leaves and saw piercing leaves. The stigma and stamen coming together. The underside of the stigma will act as a nut and screw to the stem to hold all petals in place. 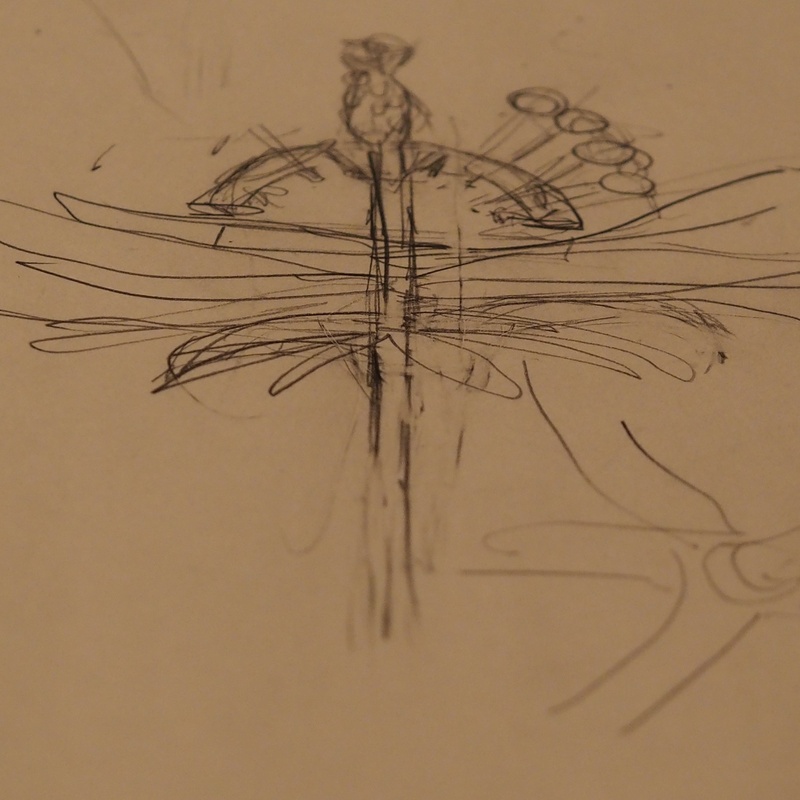 Here the stigma and the stamen will attach to the branch, between the stamina and the branch will be the 6 petals. 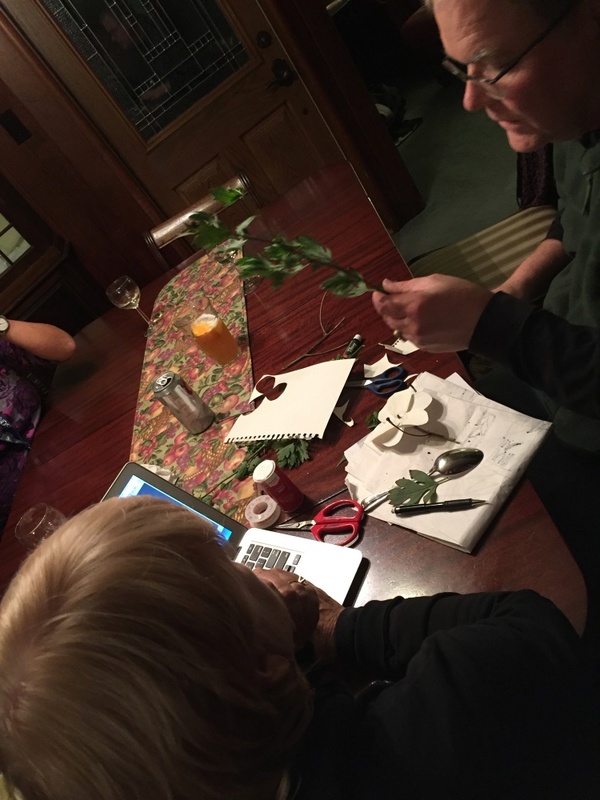 A nice stem from the garden to help us with the placement of the flower and pods. Lots of photos to work from. Celebrating a few tiny things we had make before Ethan leaves us. 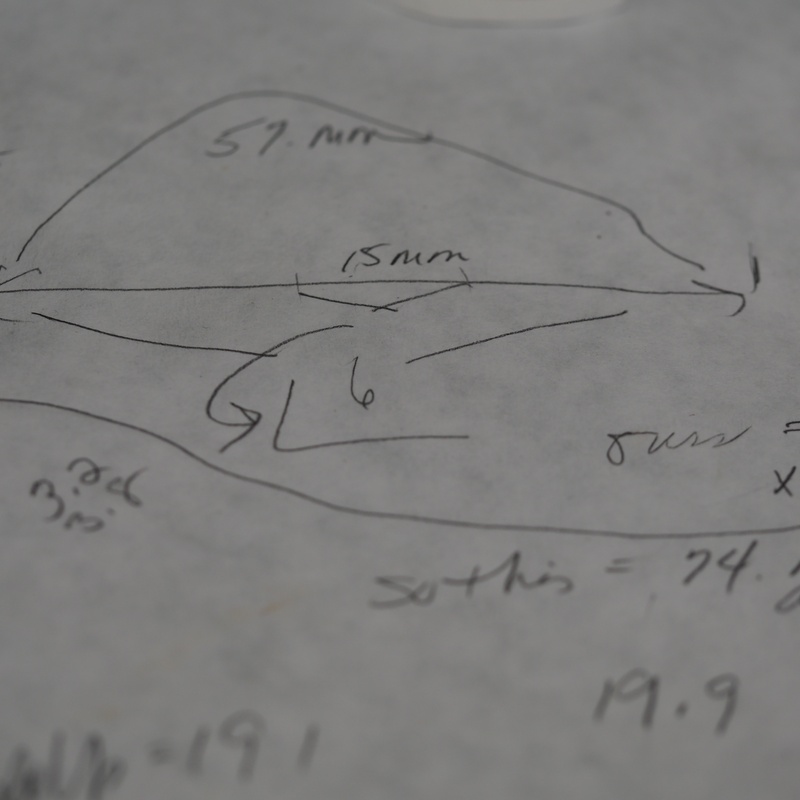 More calculation to make the flower petals. 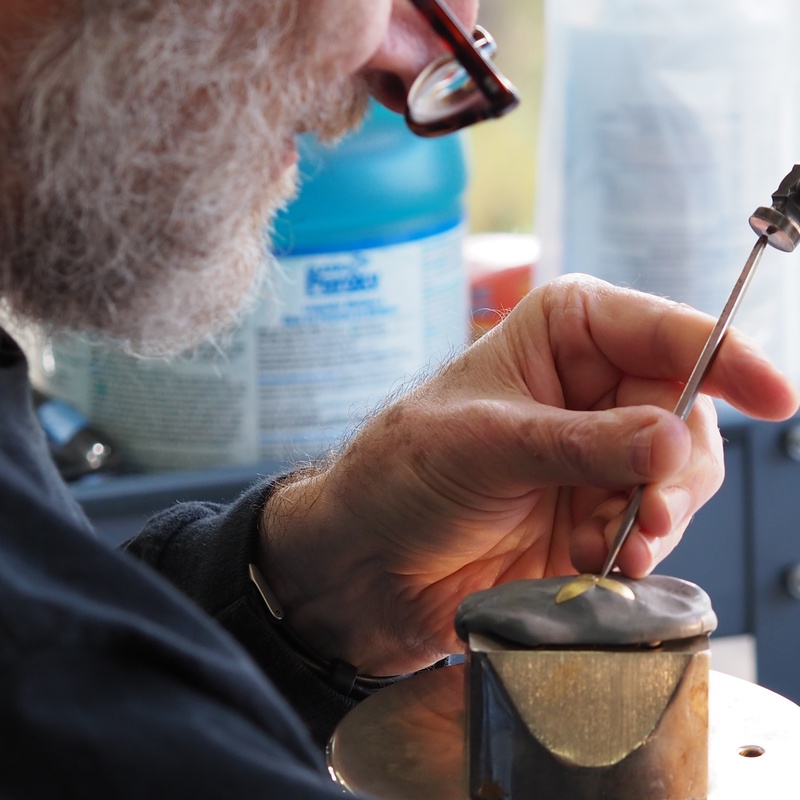 Nitric depletion of parts to start enameling. Master Bob Weinstock chasing the leaves. And Bob’s beautiful chasing on the flower buds. Our team head Master getting excited. Bob has shaped and now chasing the flower sepal. 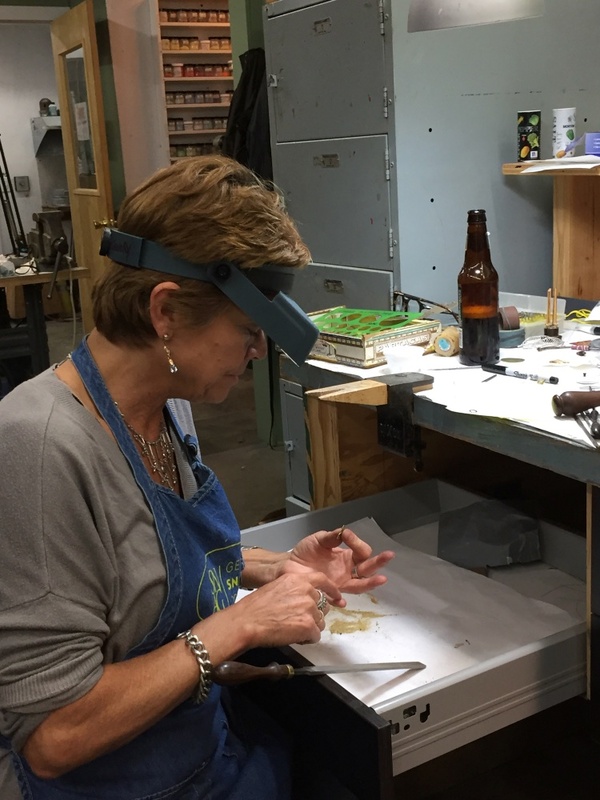 With Nancy Gardner’s help the flower is coming together. Tme to head home, in less than a week we made lots of progress! Stay tuned as we continue from our own studios. 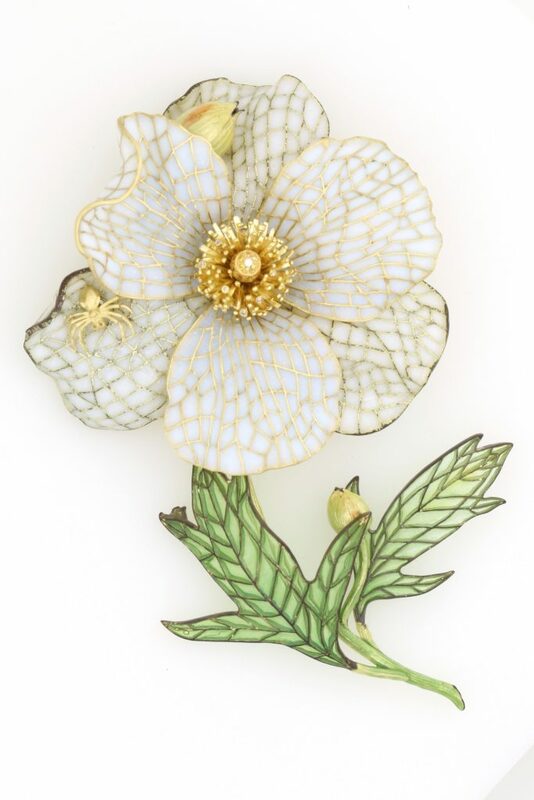 The Matilija Poppy Brooch will go to auction later this year to raise funds for the school, Mendocino Art Center. 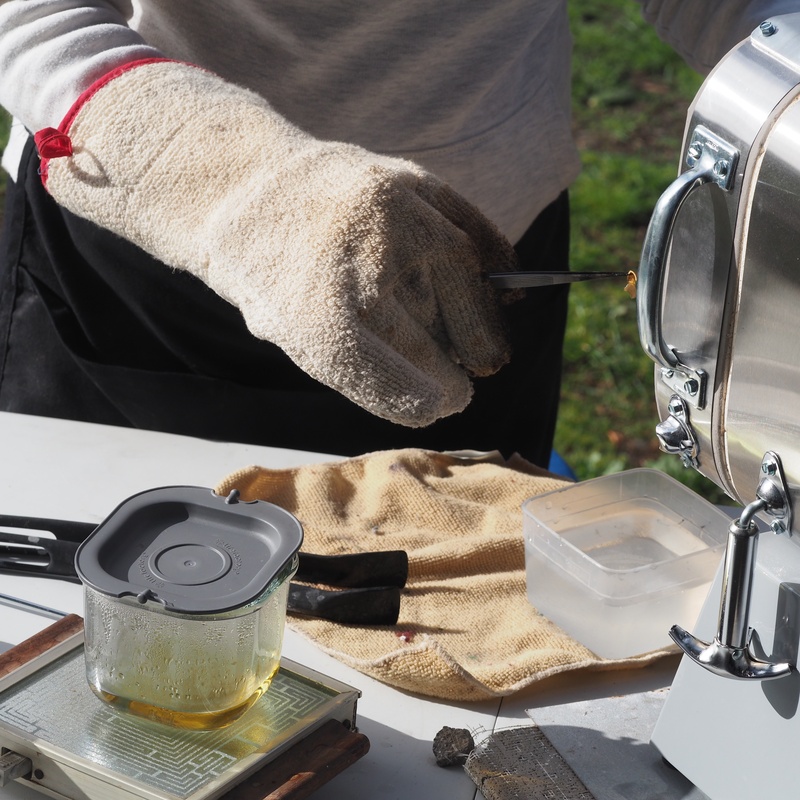 Matching colors for enameling. These are my test plates. 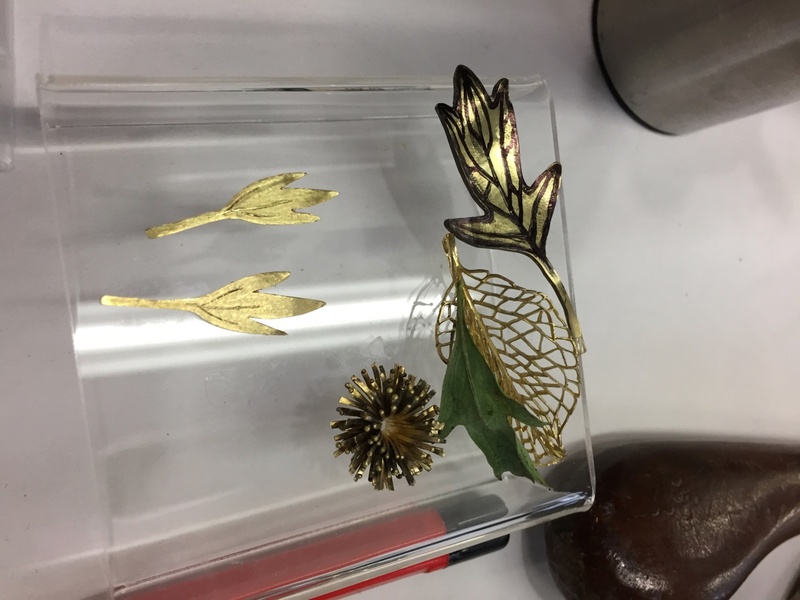 It is time to make our connection, this will pull everything together and I will be able to start the enameling process. And here is where we are today. 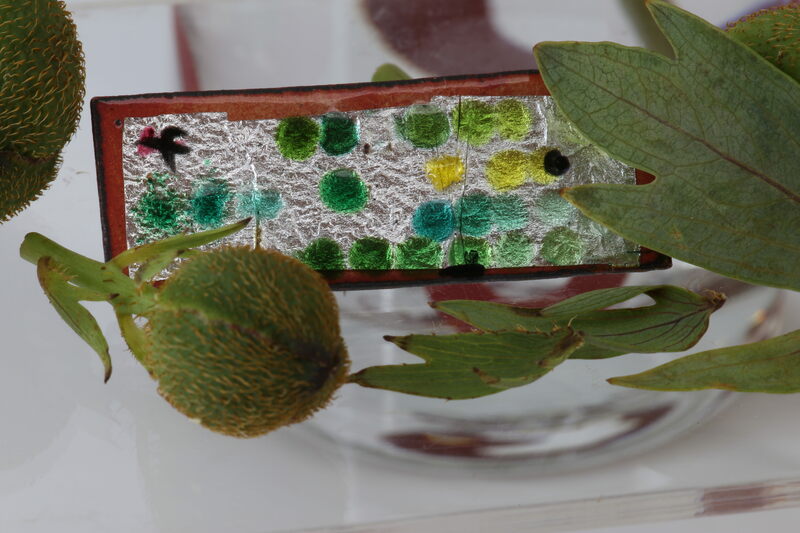 Poppy Project for Mendocino Art Center. We still have a way to go but it coming along beautifully! 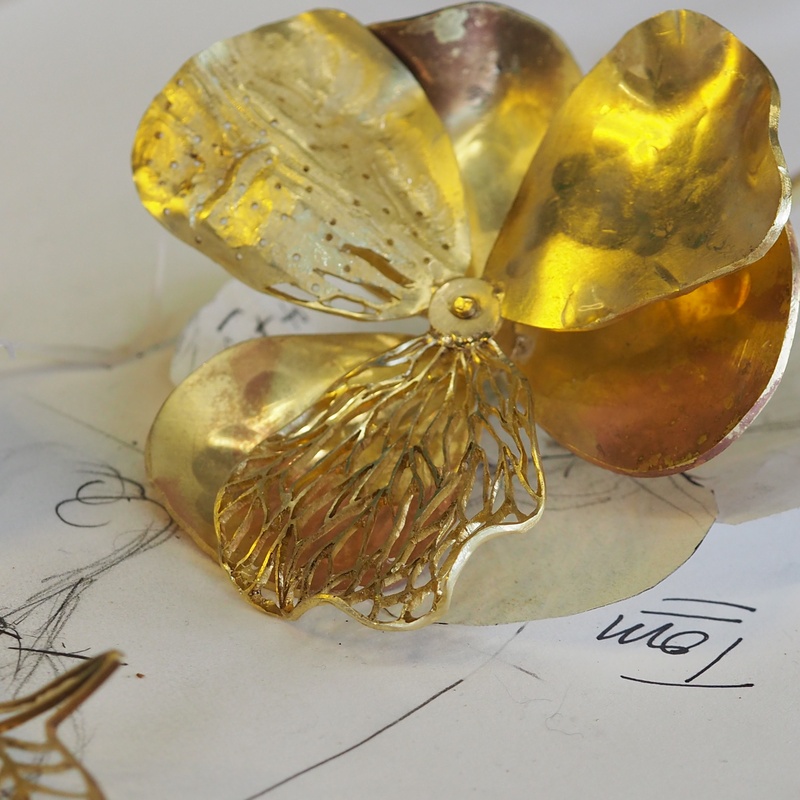 The top petal has a few hours, and this week I will be completing the lower petal group. 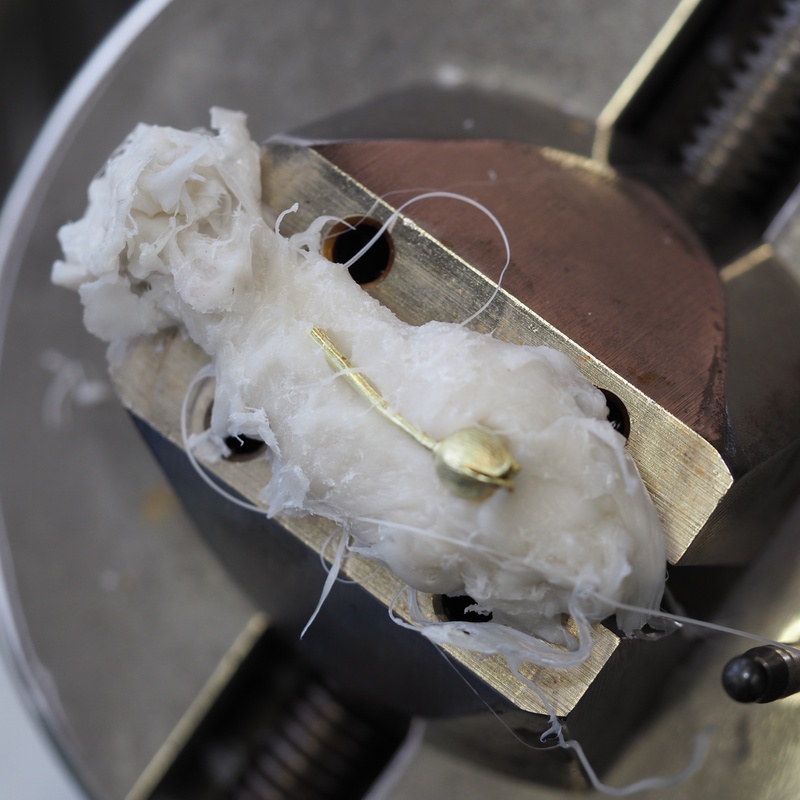 Polishing left on the stem and enamel the cute little spider *) Stay tuned! 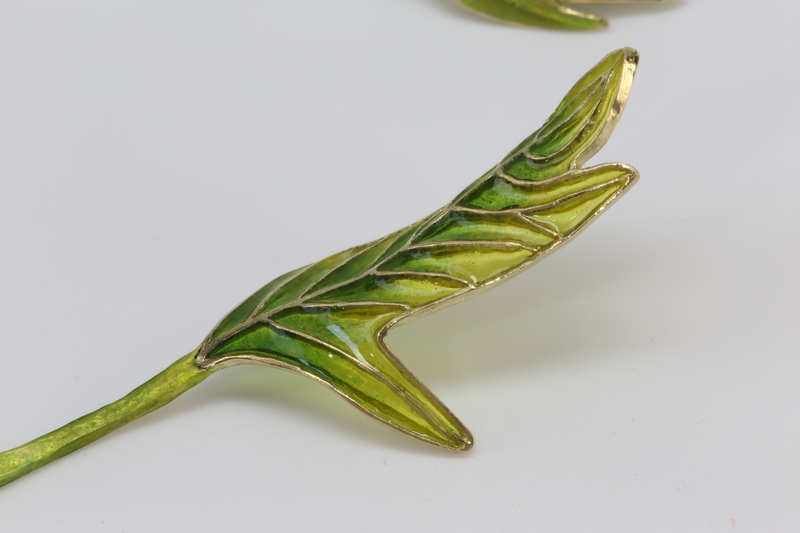 My collection of gold enamel jewelry in techniques of cloisonné, champleve and plique a jour, combines classical techniques with contemporary original designs for today`s client. 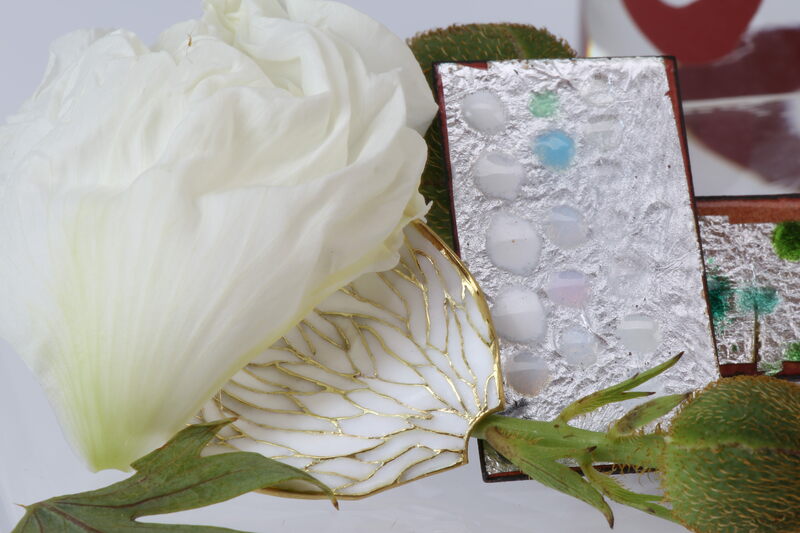 High karat metals of sliver and gold are designed to receive beautiful colors of enamel and precious stones, to create an eye-catching jewel of lasting quality. 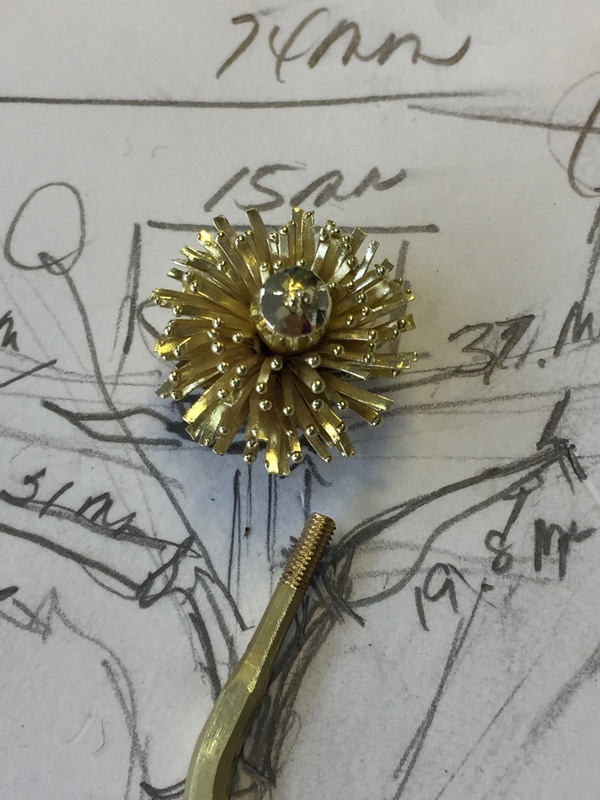 I believe jewelry is an expression of one’s personality, and I strive to create a unique piece of art that the client will forever enjoy. The work of Tom Herman is ornate, but not flamboyant. 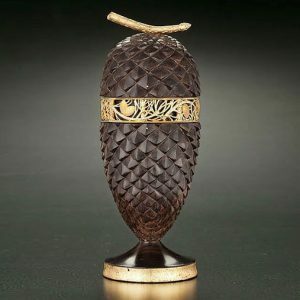 Romantic yet modern, evoking classical metalworking traditions from long ago. 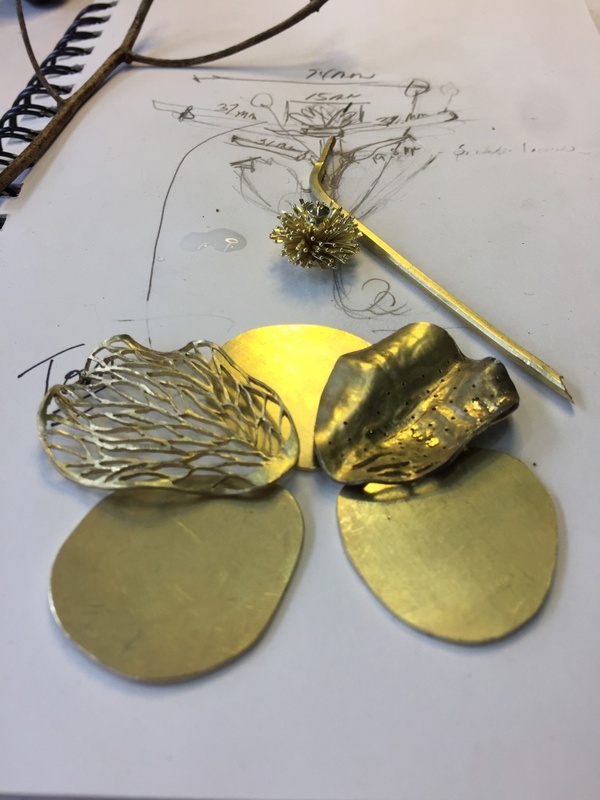 No two pieces of Tom Herman’s jewelry are ever alike, because he designs and carves each item, taking for inspiration organic forms such as leaves and flowers, or the cut of a stone he’s created. 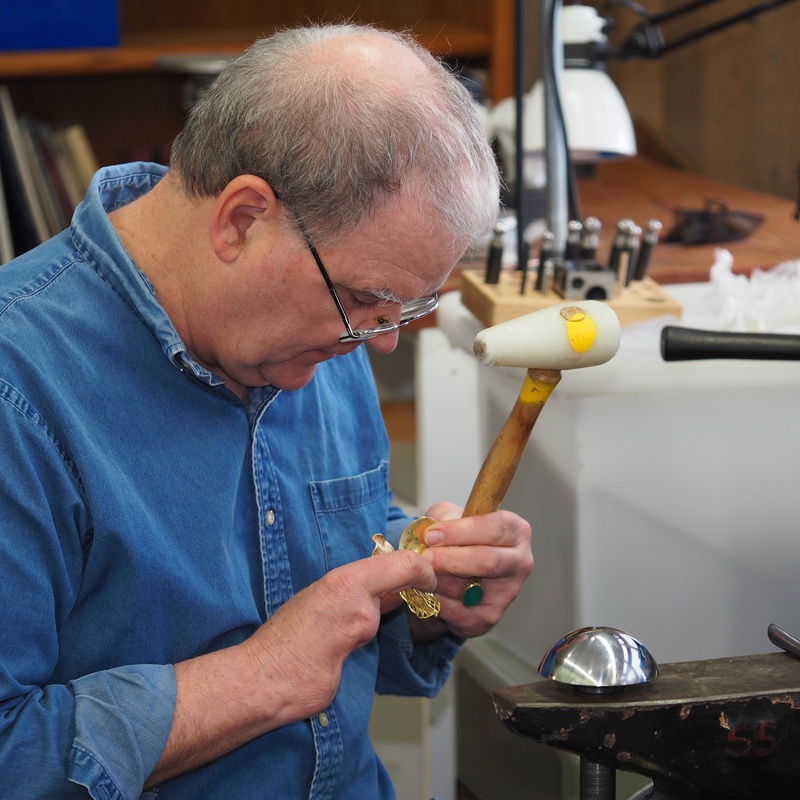 Tom’s heirloom-quality jewelry is not the kind of work that will sit in the bottom drawer of your jewelry case.